When I was younger, the ultimate torture that my mum could inflict was to make me watch Gardener’s World. It was just soooo boring! And to be fair, despite now being a homeowner with a decent sized garden, I’m still not really that interested in flowers and plants. I have one raised flower bed in my garden, and I’ve established a ‘Darwinism’ style of gardening. 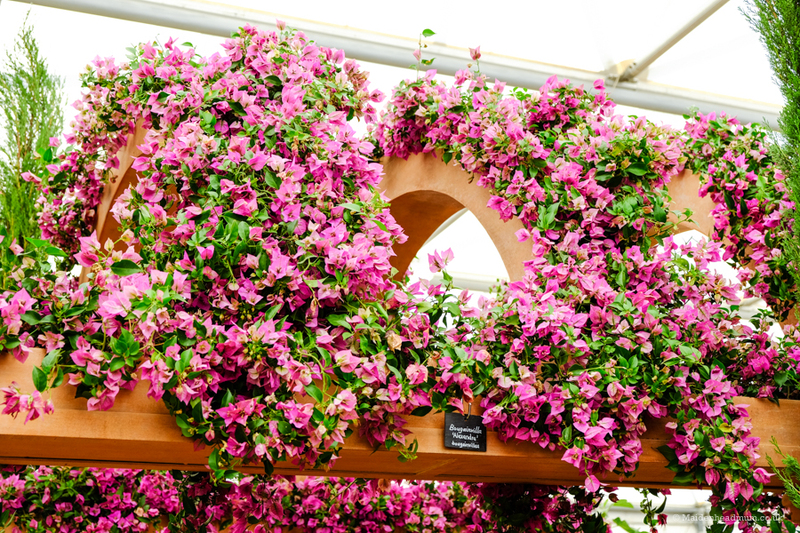 Despite my Nan and my Mum offering expert guidance in selection and planting, I’m afraid that only those plants that can adapt without any TLC or additional watering from me can survive and flourish. 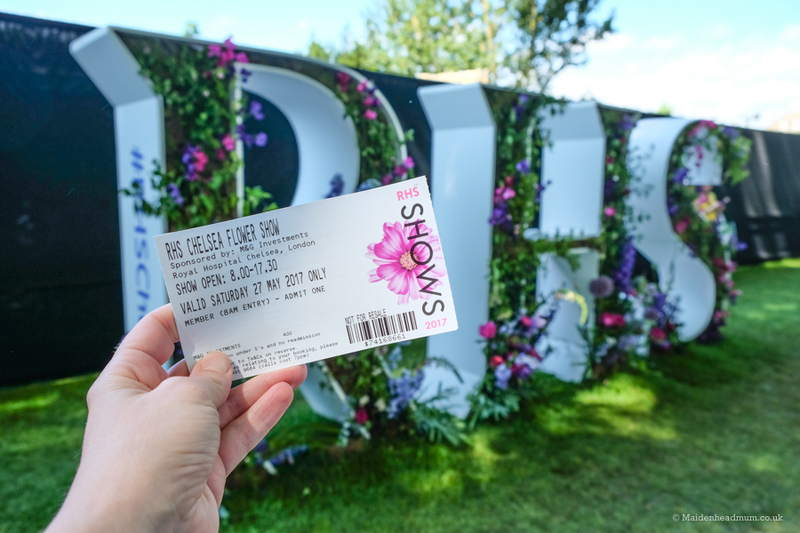 So when an unexpected invite to the RHS Chelsea Flower Show came my way from a friend, I wasn’t quite sure how to respond. My first thought was to chuckle and politely decline…but I hesitated. 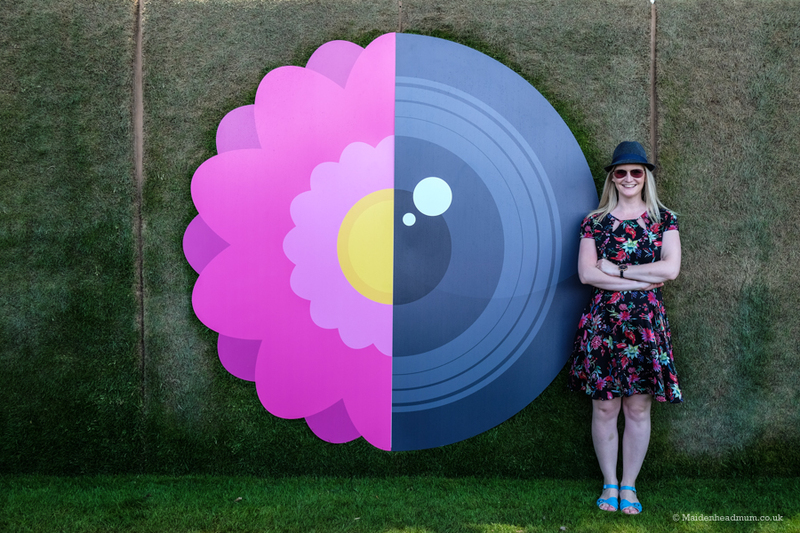 Not only was the invite from a good friend… but she isn’t very ‘flowery’ either. Although we’ve met through being mums in Maidenhead, we’ve established a firm bond over our teenage love for Jarvis Cocker and Dr Marten Boots. So I had a hunch that we could have a really good day out anyway, even though we have minimal garden aspirations between us. 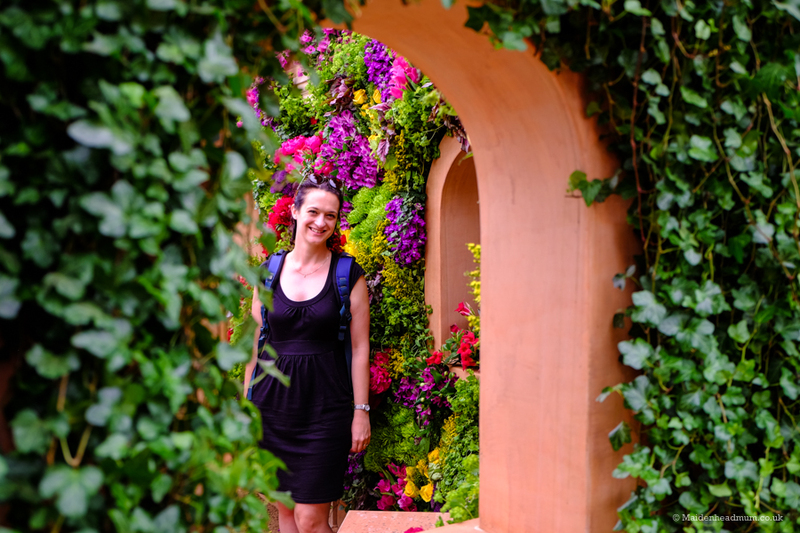 Visiting The Chelsea Flower Show when you’re not really into flowers. 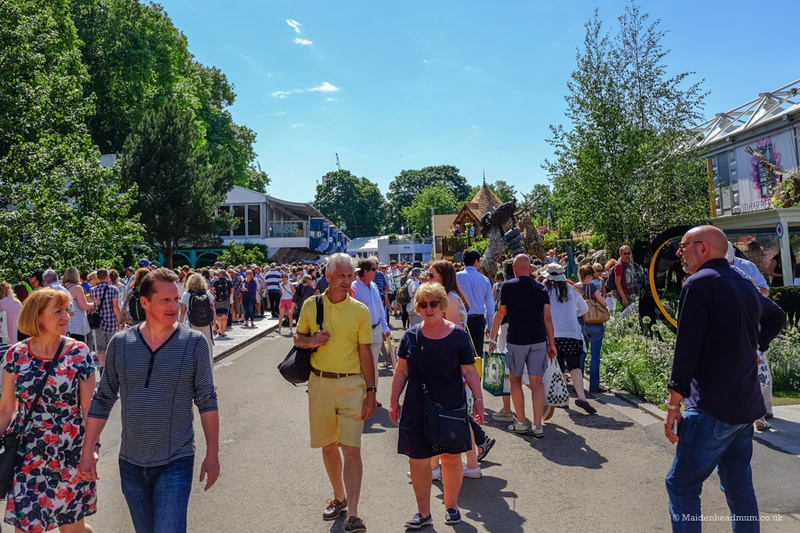 When I started looking into the idea of a day at the Chelsea Flower Show, I found lots of articles from gardening experts and journalists, but I couldn’t really find many real life experiences of what it’s like to visit as a member of the public on a busy Saturday. 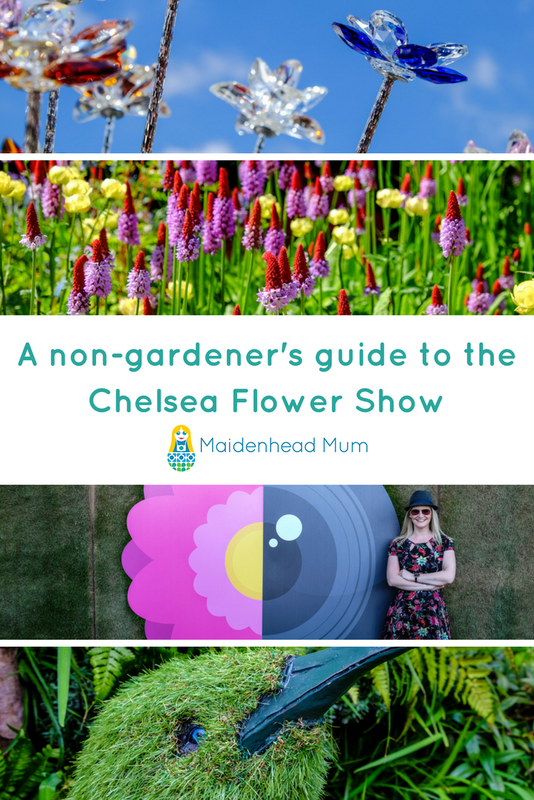 I think it’s pretty common in relationships that one person LOVES gardening and the other isn’t really into it as much, so I thought it would be useful to share my experiences of what it’s like visiting the show when you’re not really into gardening. I hope it inspires some of you that have been sitting on the fence about going! 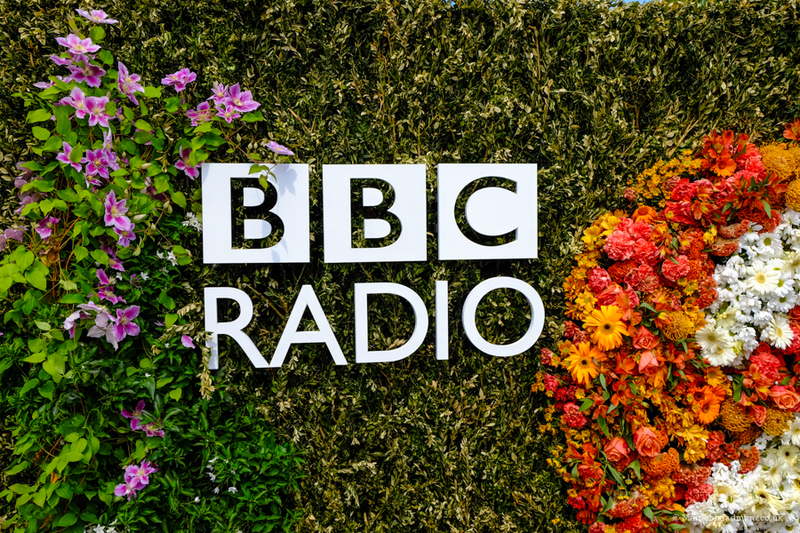 You might have seen it on the telly, but what’s the show actually about? 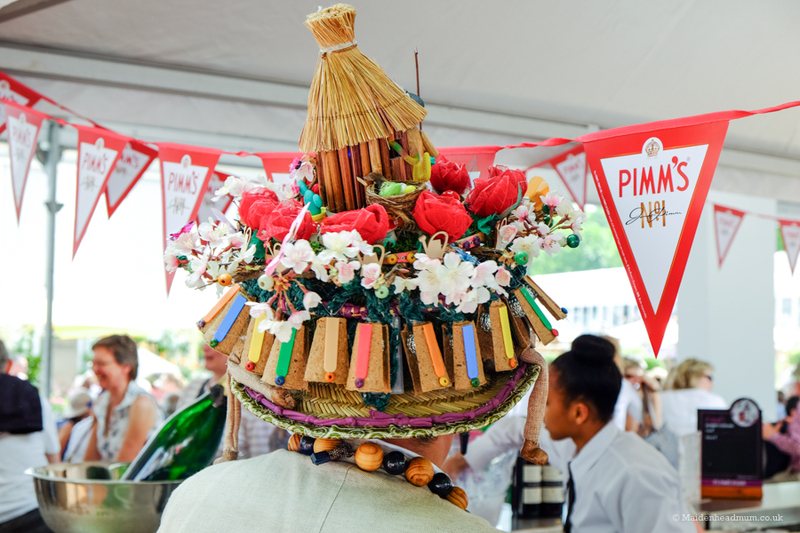 The annual event is held across five days in May in the grounds of the Royal Hospital Chelsea in London and attracts around 150, 000 visitors from around the world. 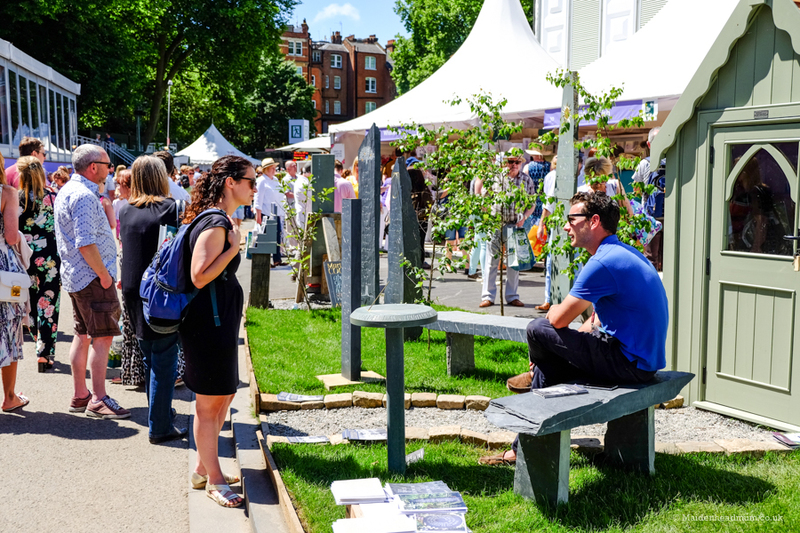 It’s the place to see cutting-edge garden design, buy new plants and be inspired with ideas for your own gardens. This year the event was sponsored by M&G Investments and as my friend Rebecca from Hugos Workshop had done some amazing fundraising with Tommys, (who M&G support), she was given a pair of complimentary tickets to attend. It can be hard to get hold of tickets for the event unless you book really early. ‘R’ is for Rebecca from Hugo’s Workshop. 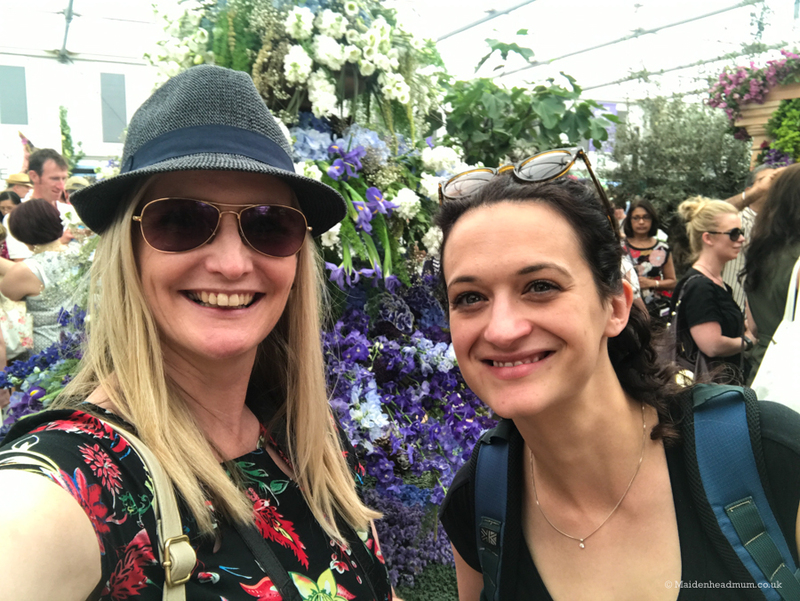 Two non-flowery ladies at The Chelsea Flower Show. The show is open to the public on the Saturday and Sunday and reading through the reviews on trip advisor I could see that it had a tendency to get REALLY busy, even though it is a ticketed event. People were saying that the gardens had crowds of people ‘9 deep’ later in the day, making it tricky to see anything. It was clear we needed to be there early to make the most of it! 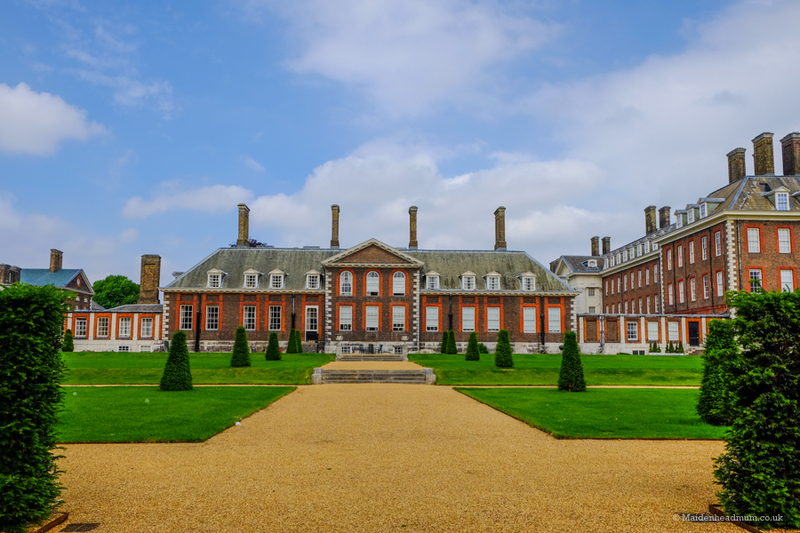 The Royal Hospital grounds are around a ten-minute walk from Sloane Square tube station which is on the Circle line. 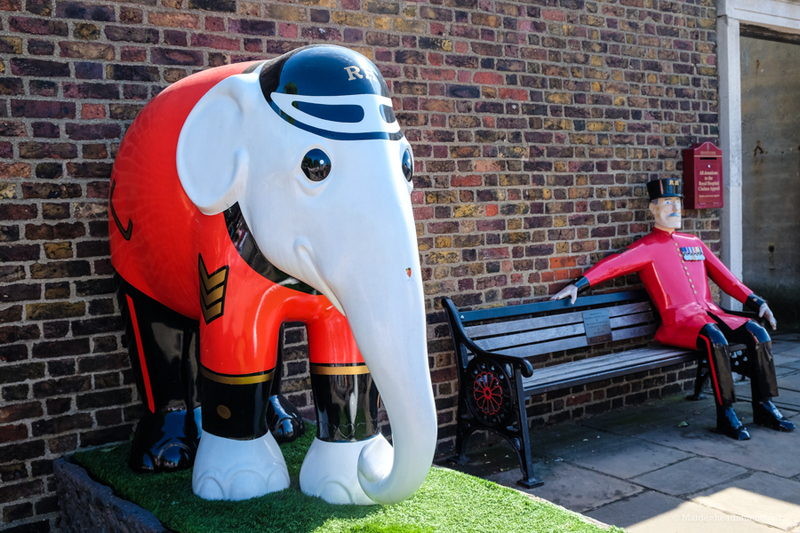 If you’re travelling from Maidenhead, this would be around a 15-minute journey. We decided to drive part of the way there, parking at East Acton which has free on-street parking at the weekend. We then caught the Central Line to Notting Hill Gate and planned to get the Circle Line down to Sloane Square. Except the transport fairies were not on our side, and the Circle Line was closed! 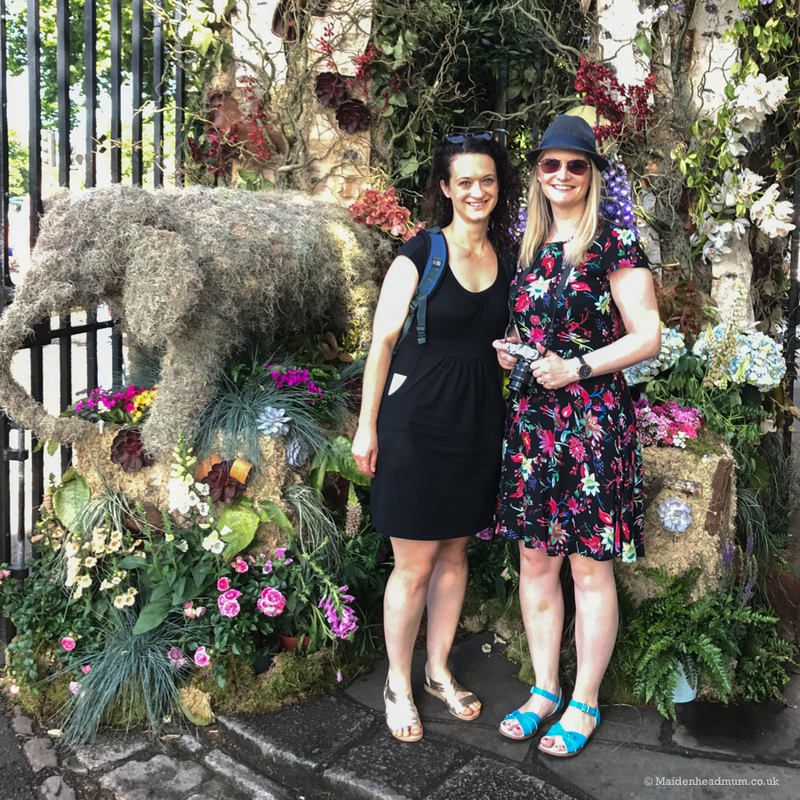 As two ex-London girls, we suddenly felt like stranded tourists as we tried to summon our ‘public transport ninja’ skills from our youth. 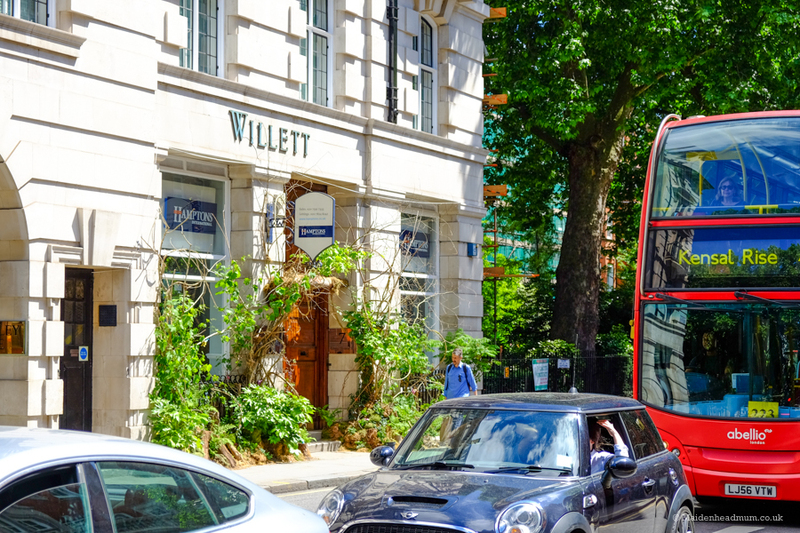 The urge to Uber was strong, but my spirit of adventure was high, and so we took directions to the nearest bus stop and found ourselves on the top deck of a bus heading to Sloane Square in no time at all. We made it to the gates at 10am, and there was a short queue, which was mostly while everyone went through security and bag checks. 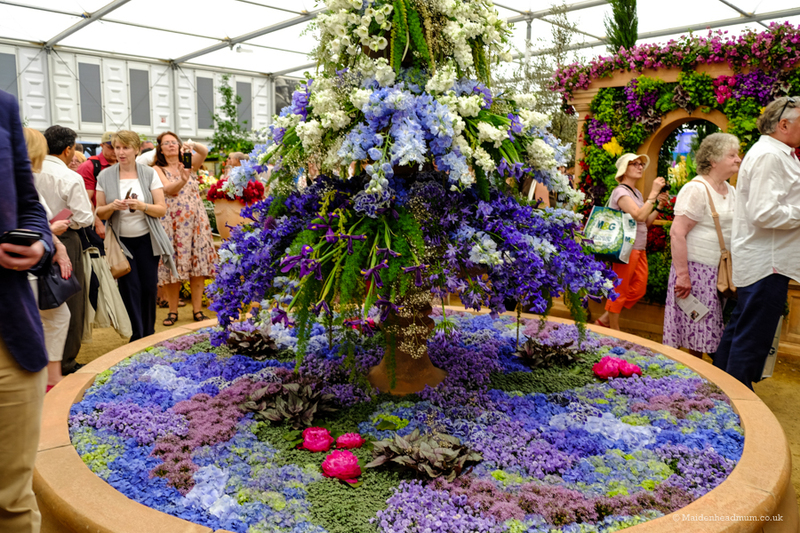 The Royal Horticultural Society has lots of useful tips to help you plan your journey. 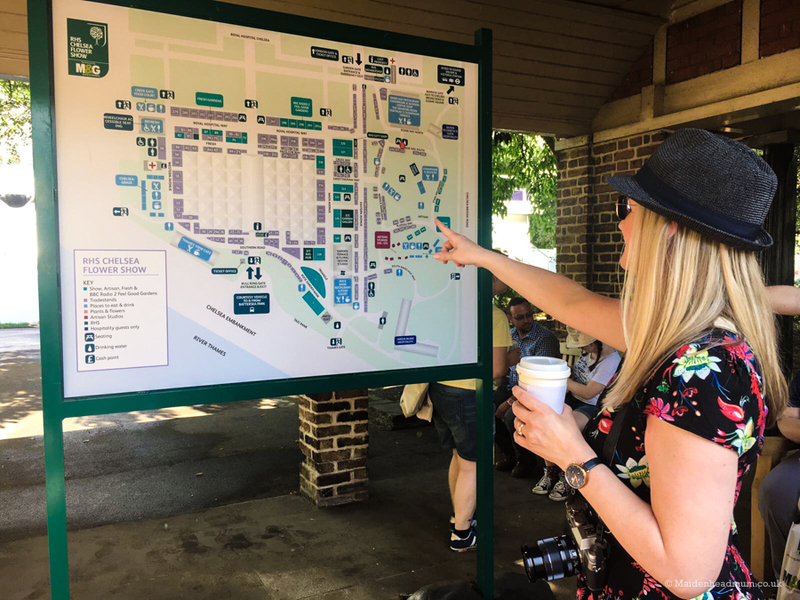 As soon as you enter the show you get a reminder of this history of the show grounds. There was already a queue at 10am but it was fast moving. 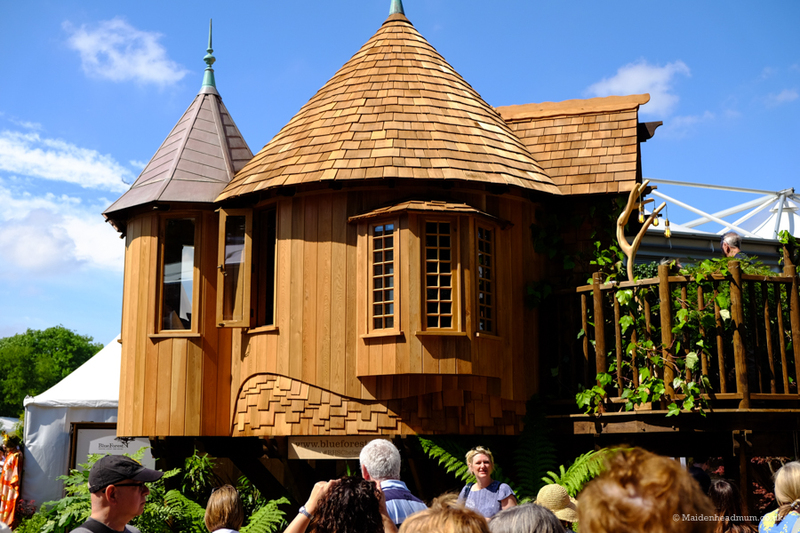 At the 2017 Chelsea Flower Show, there were eight Show Gardens, five Fresh Gardens, nine Artisan Gardens and more than 100 floral displays including a huge ‘Great Pavilion’ which is big enough to park 500 London buses in. 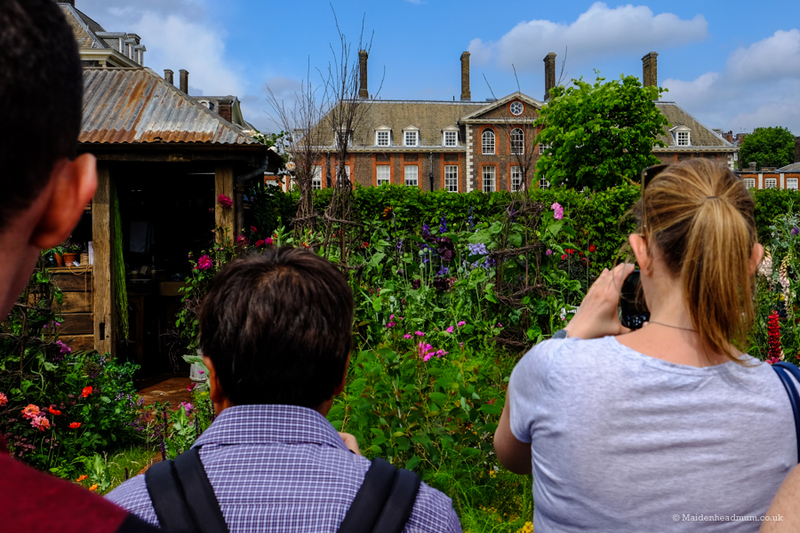 The gardens are designed so that you can walk past them and stop and take photos, but you don’t get access to go inside them. 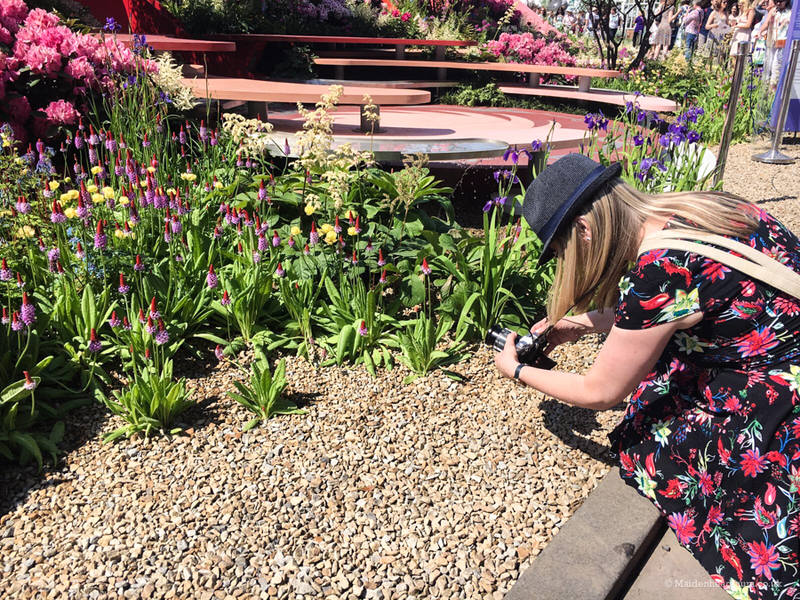 Although there is usually lots of coverage and insight about their design across the media in the week before the show opens to the public, I confess that I hadn’t really done much research about the gardens. (Probably should have asked my mum!) This meant that neither Rebecca or I had any ‘must sees’ that we needed to rush and queue for. Instead, we took a ‘lets just see what we see’ approach and wandered around, stopping when things caught our eye. 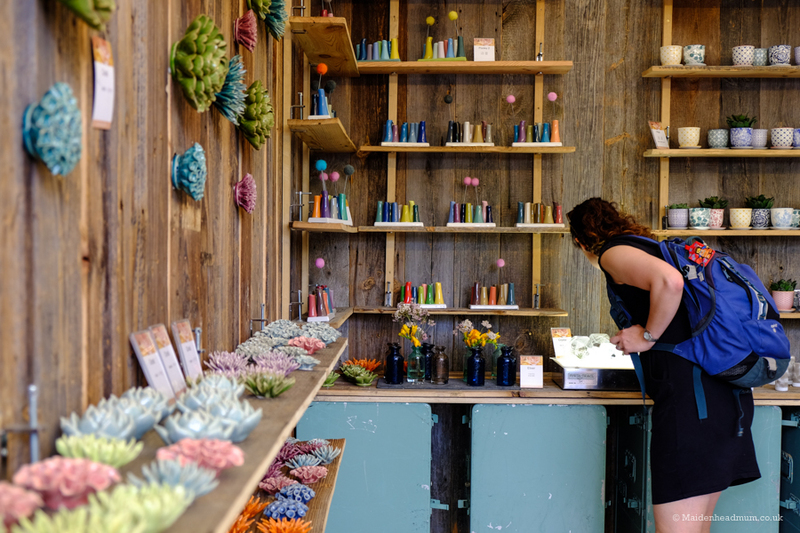 At Hugos Workshop, Rebecca creates beautiful gifts from oak, so we were naturally drawn towards the textures and contemporary designs as we walked around. 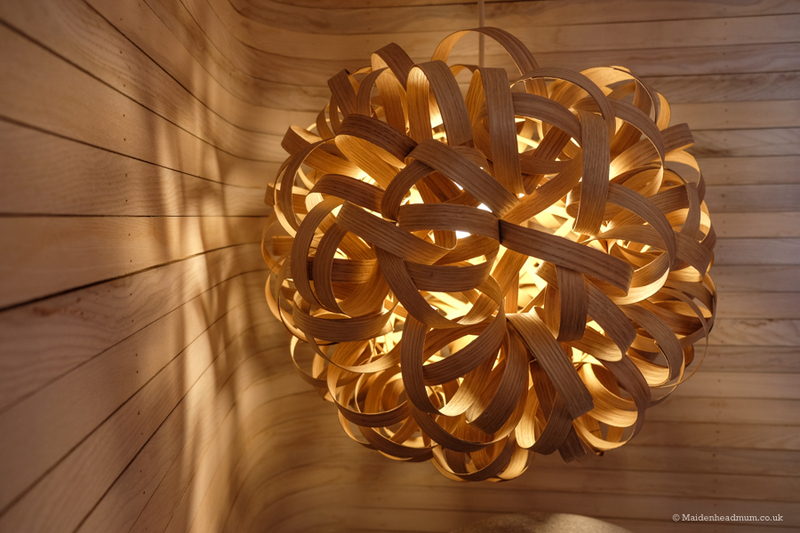 We saw things crafted from driftwood which celebrated the natural form and urged you to stroke them… and then saw the opposite: wooden designs inspired by nature but shaped by steam and made by hand. The showroom of the British designer Tom Raffield was particularly amazing. 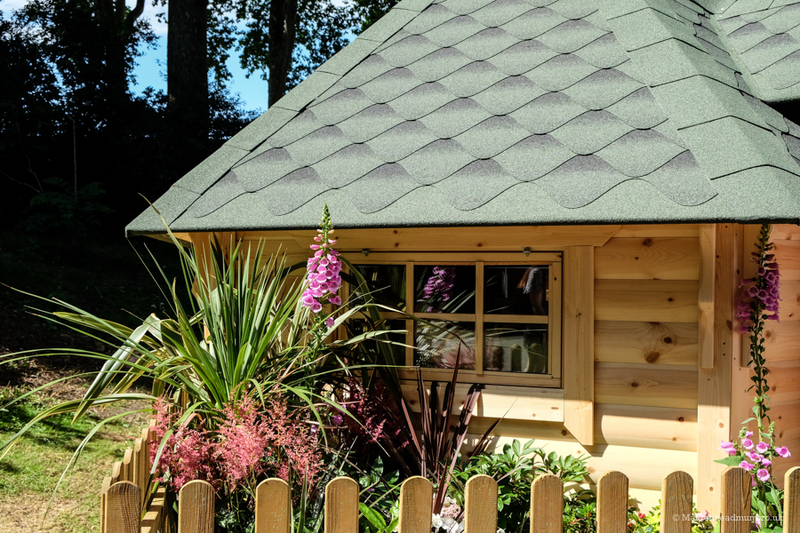 I’ve since come across his designs on the John Lewis website and on Grand Designs! 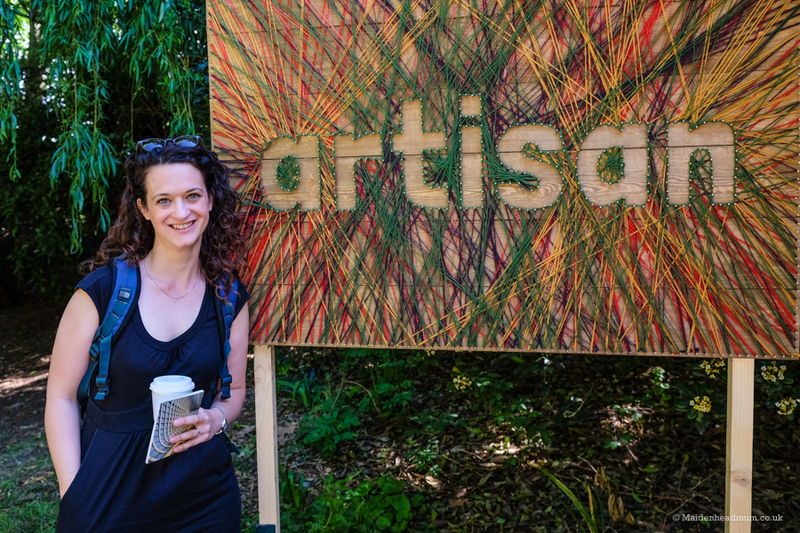 Our first visit was to the Artisan Gardens which all looked so settled and established that it was hard to believe they had been built from scratch 19 days ago for the show. 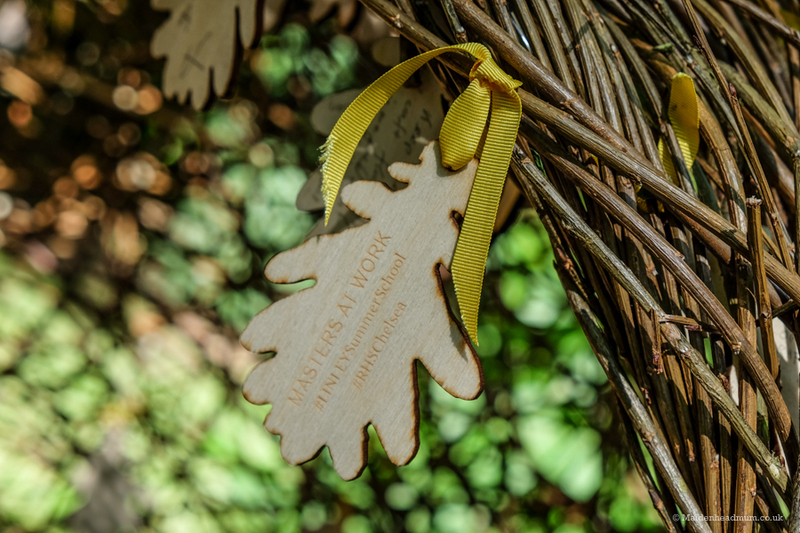 I can remember walking down the hill with the rays of sunshine twinkling through the canopy of trees above us. 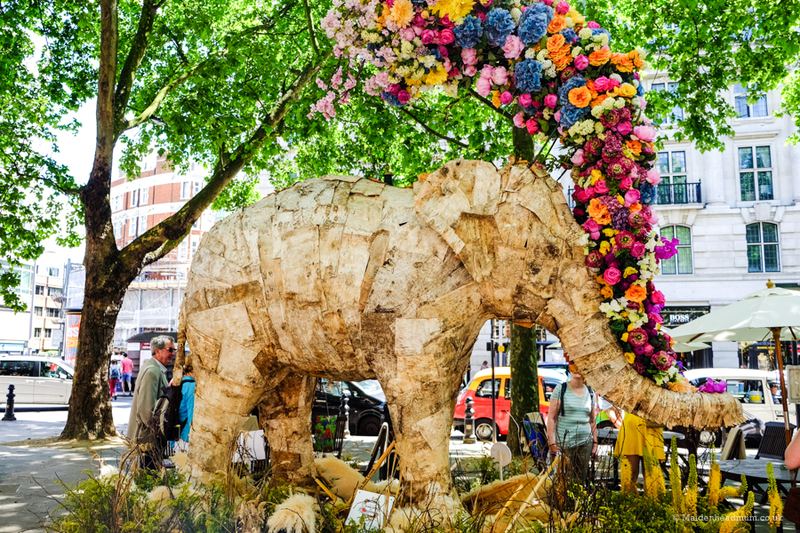 We were suddenly a long way away from the urban sights, sounds and smells of central London: we were transported to a lush, tropical world where the pollen fell like soft snow in front of our eyes. The footpaths are wide and easy to walk on… but you spend a lot of time on your feet so wear comfy shoes! 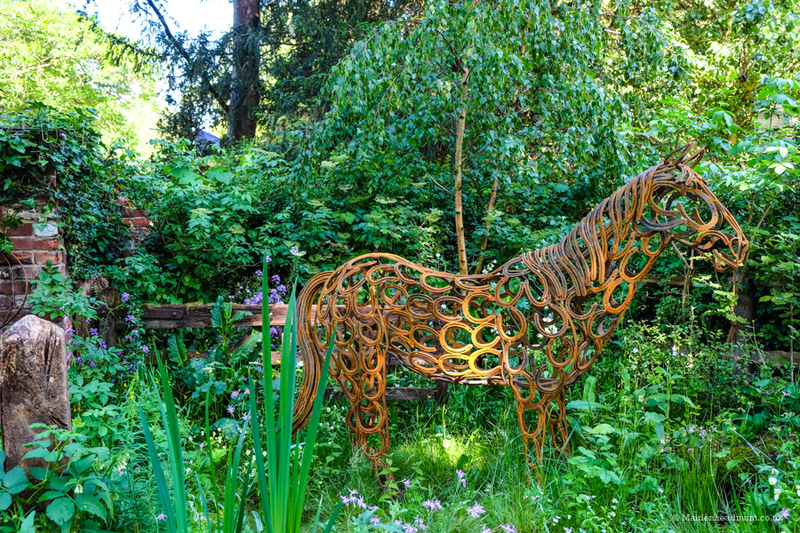 The Horse Welfare Garden by Adam Woolcott and Jonathan Smith featured a sculpture, walls and a stable which look centuries old but were created for the show. 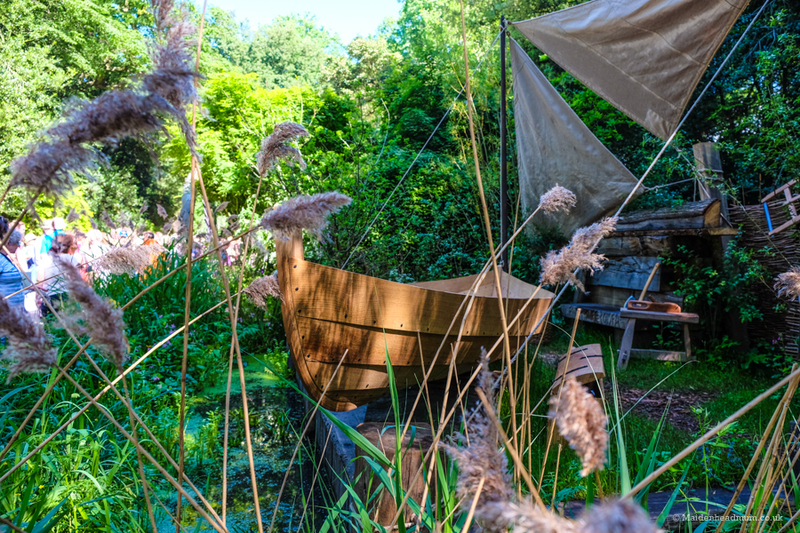 The IBTC Lowestoft: Broadland Boatbuilder’s Garden had lots of wild plants commonly found in fenland and waterside areas and featured a replica of a 900 year old boat. 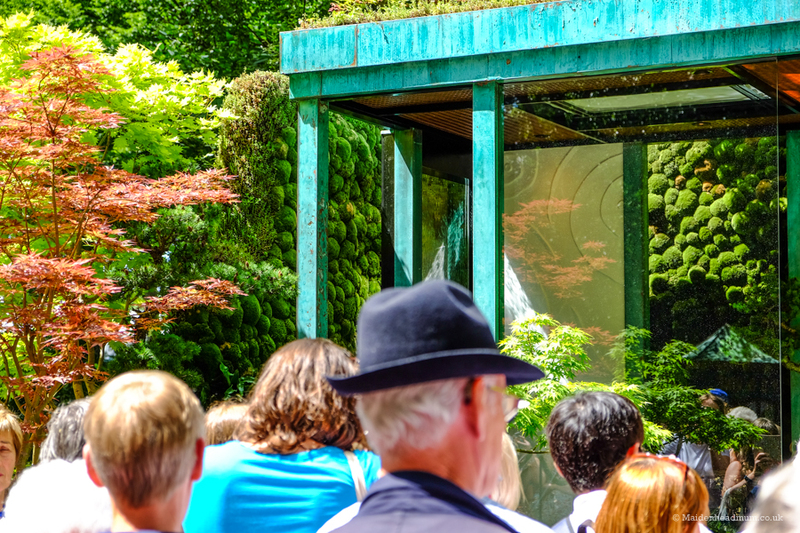 The Japanese water garden ‘Gosho No Niwa No Wall, No War’ was really popular. I liked the bright colours of the foliage and the turquoise pavilion. 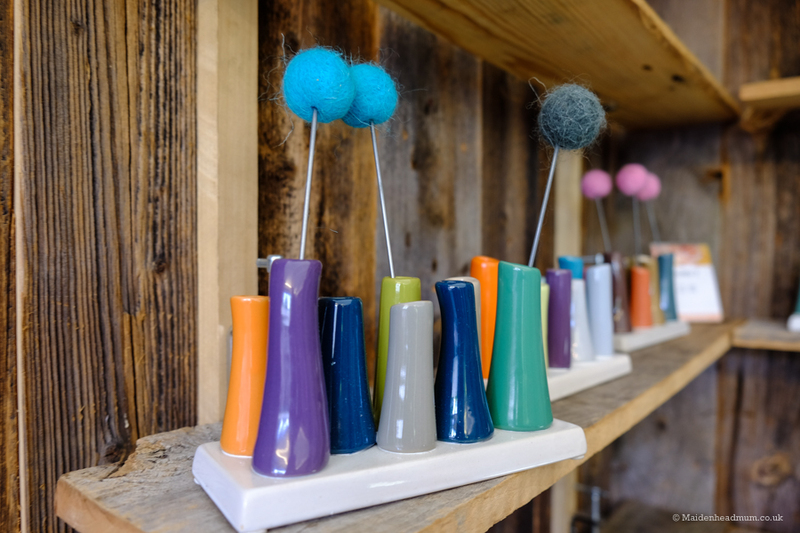 There were some lovely handcrafted pieces of furniture in the Artisan Studios. 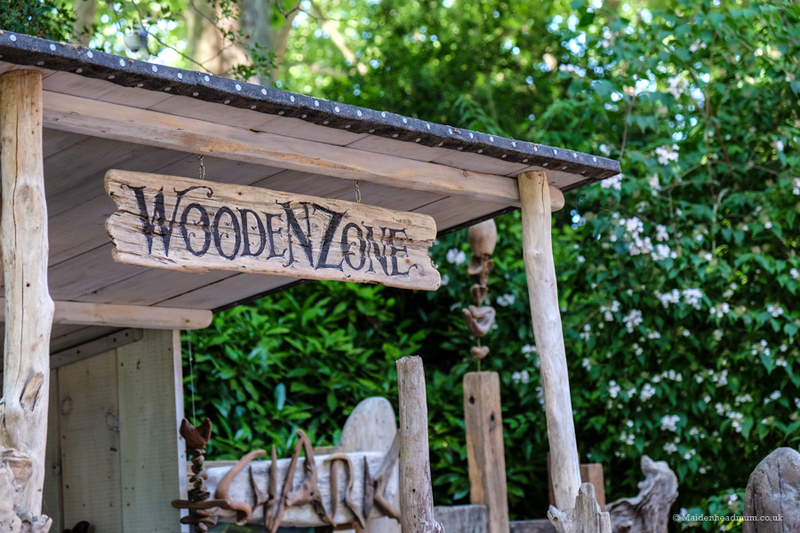 I liked how this ‘label’ was carved out of wood too. 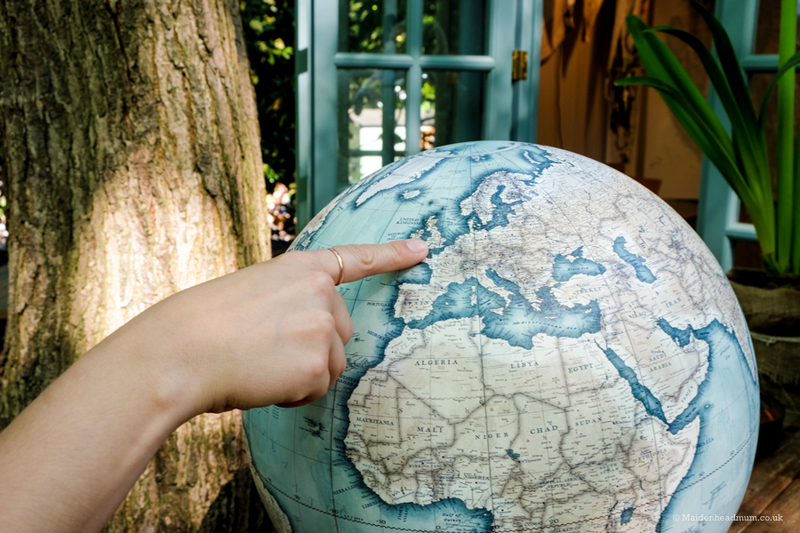 These handmade and hand painted globes at the Artisan Studios made by Bellerby & Co caught our eye. they were beautifully crafted. Putting Maidenhead on the map! 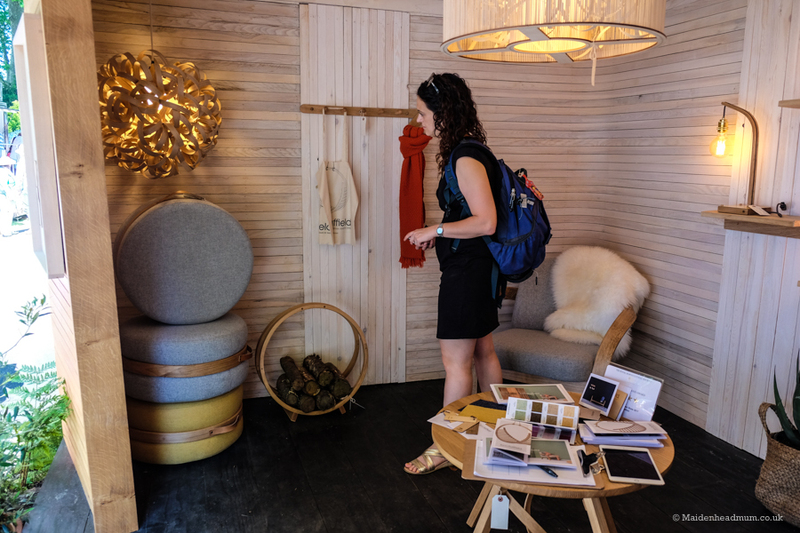 I loved the fact that the designers were on hand and were friendly and approachable. My friend Rebecca was interested in signing up for a carving course. In the centre, there was a ‘high street’ with a mix of smaller retailers and a few well-known brands (I had quick peek at the Joules concession!). 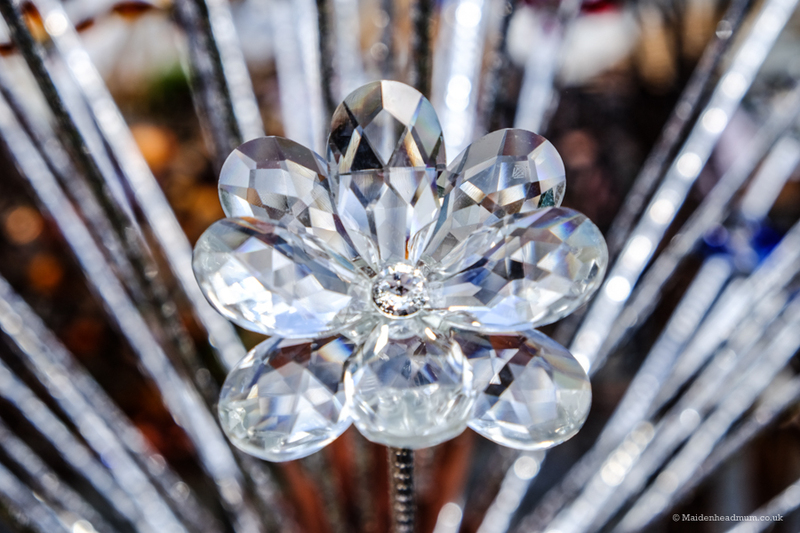 I liked seeing the contemporary design elements in the gardens and found I was kept very busy taking photos. The trade stands had lots of unusual gifts that you could buy. Mooching… and getting inspiration. Everything was presented so beautifully. 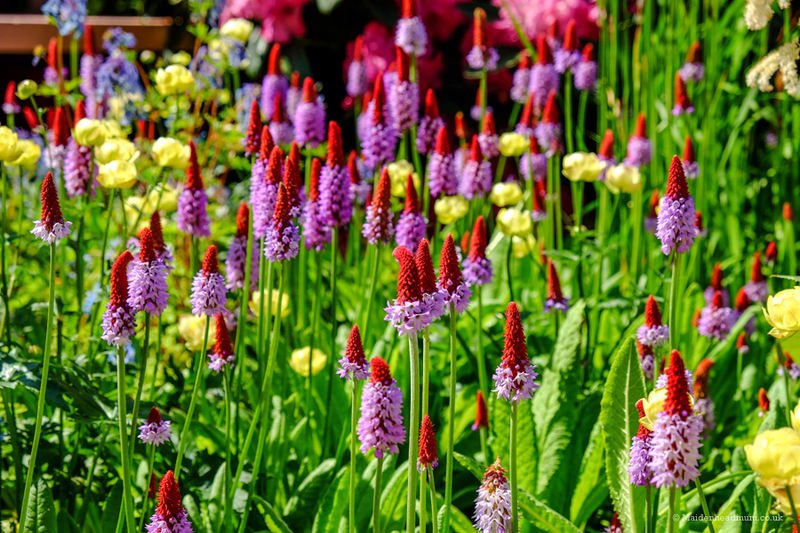 I liked the shape and colour of these… but had no idea if they were meant to do anything other than look pretty?! Either way, they would never last long in our house with two small children! 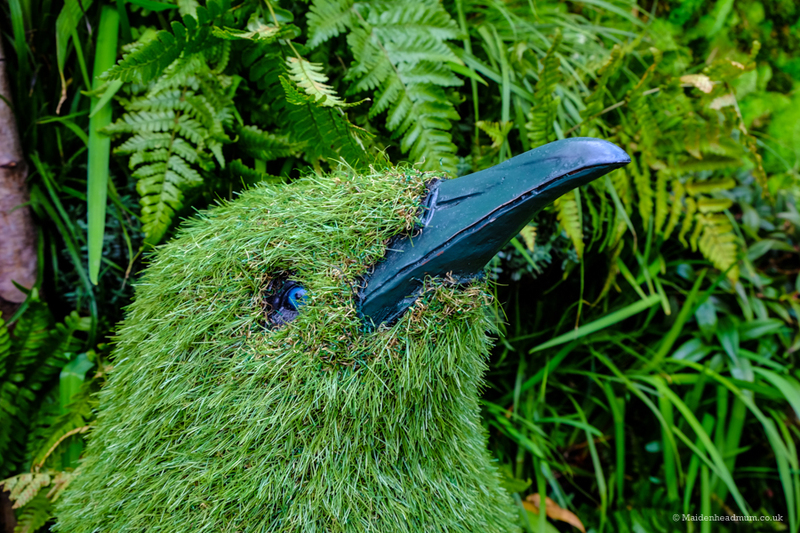 You can buy pretty much anything for your garden: how about a giant bird made out of ‘Easigrass’? 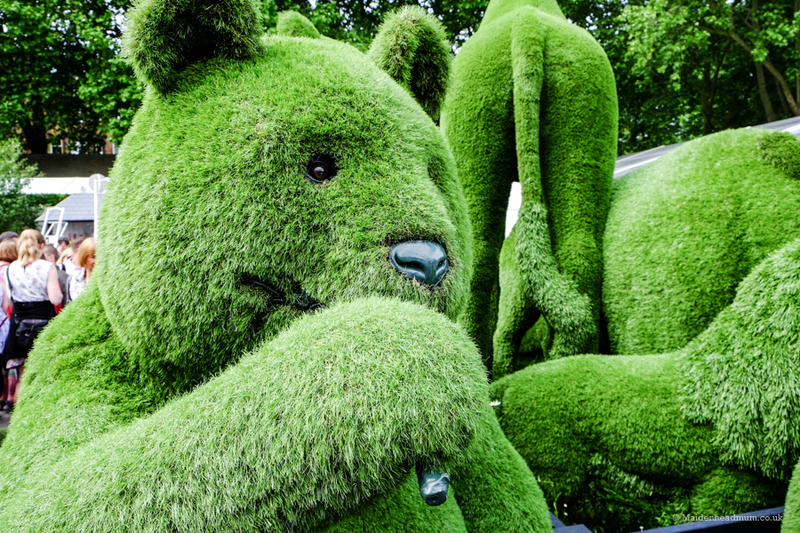 Or if birds aren’t your thing, how about a giant bear to keep an eye on the kids?! 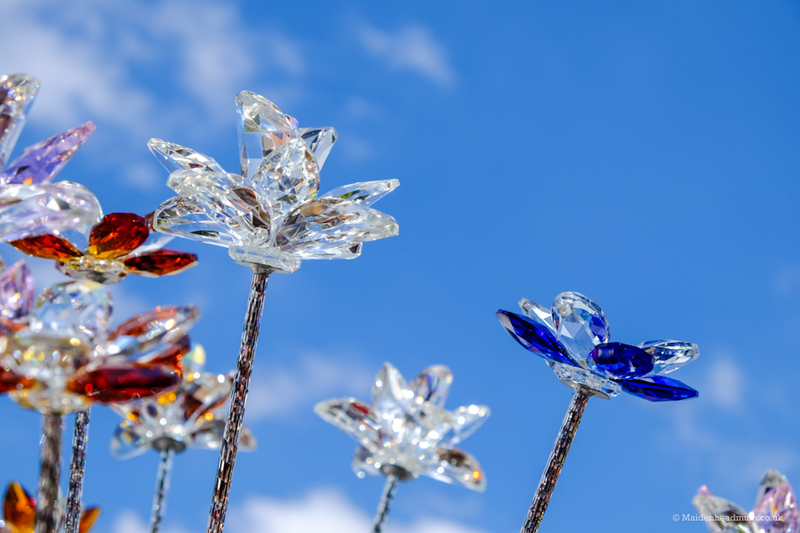 Outside the Great Pavilion, these Crystal flowers caught my eye too. £25 per flower. Possibly not the best investment with my kids around, but oh how sparkly they were! I hadn’t really thought much about Garden accessories, but there were so many options available. I think my daughter would be thrilled to bits with this in our garden! Or this one, this was epic! 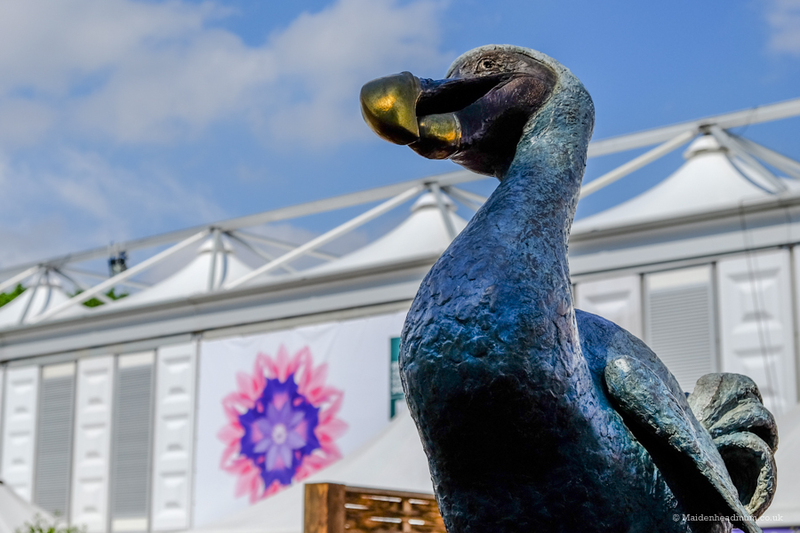 A dodo sculpture outside the Great Pavillion. 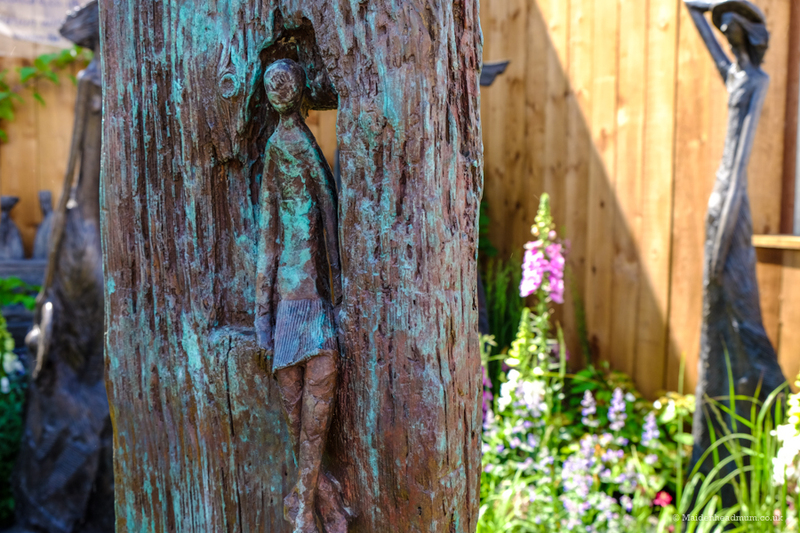 All throughout the show, there were so many flashes of colour and texture which seemed to be rendered in ‘HD’ by the bright sunshine and the blue skies. 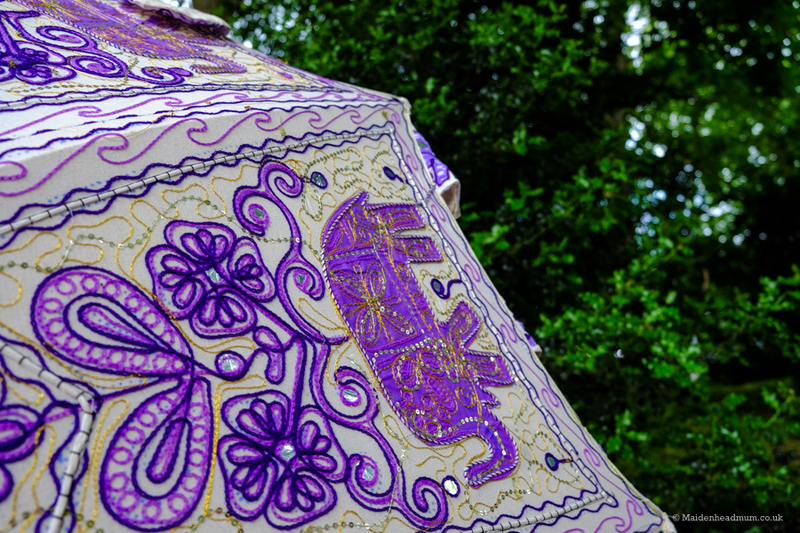 It would have been a completely different experience in the rain, so we were very fortunate. 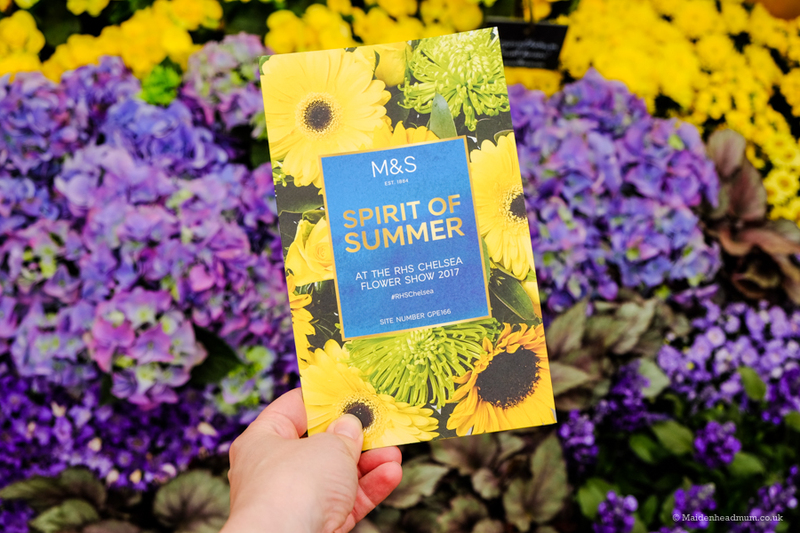 One of my favourite sights was the ‘Spirit of Summer’stand by M and S! 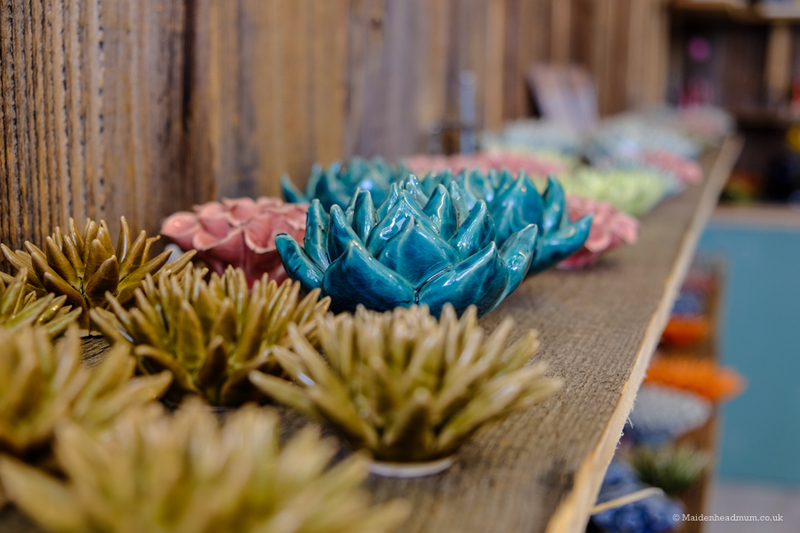 Their display was inspired by the Mediterranean and was a 3D masterpiece that you could walk around, look through and… um… touch and stroke! Yes, we did. 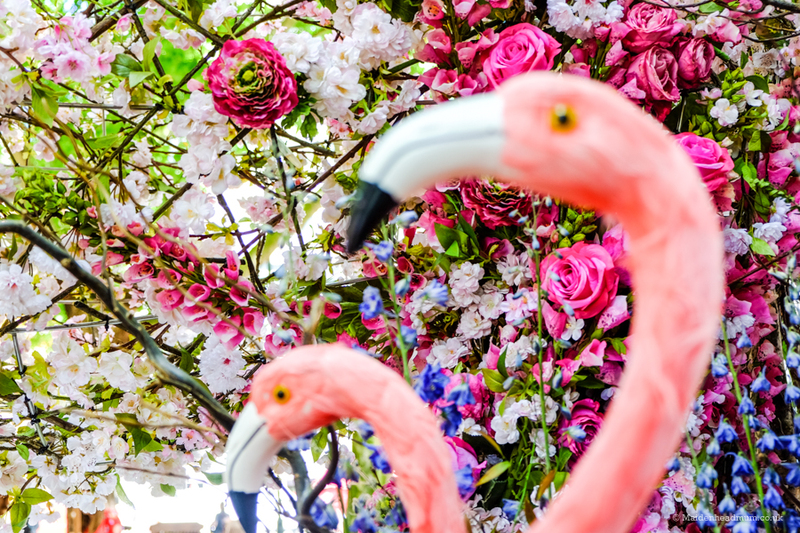 We couldn’t help but want to touch the flowers, they just looked so brilliant and hyperreal. The clever use of contrasting colour had a really strong impact. The colours were good enough to wear! 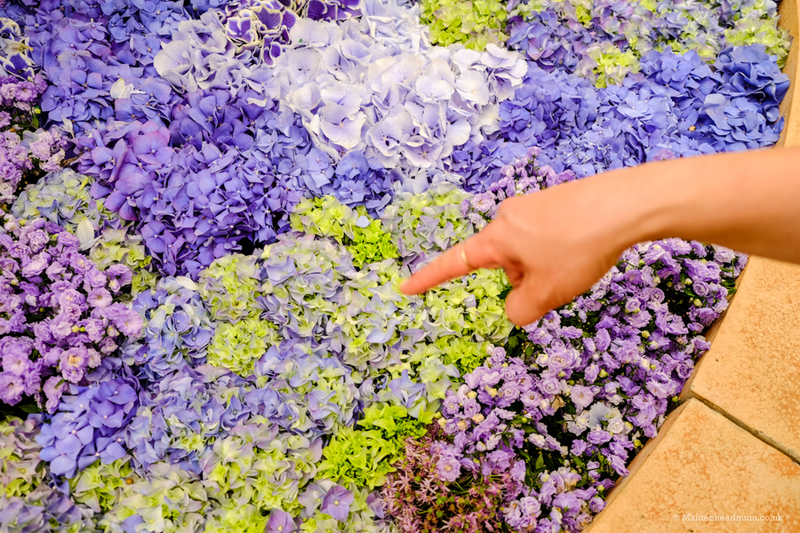 When your non-flowery friend feels the need to stroke the flowers! 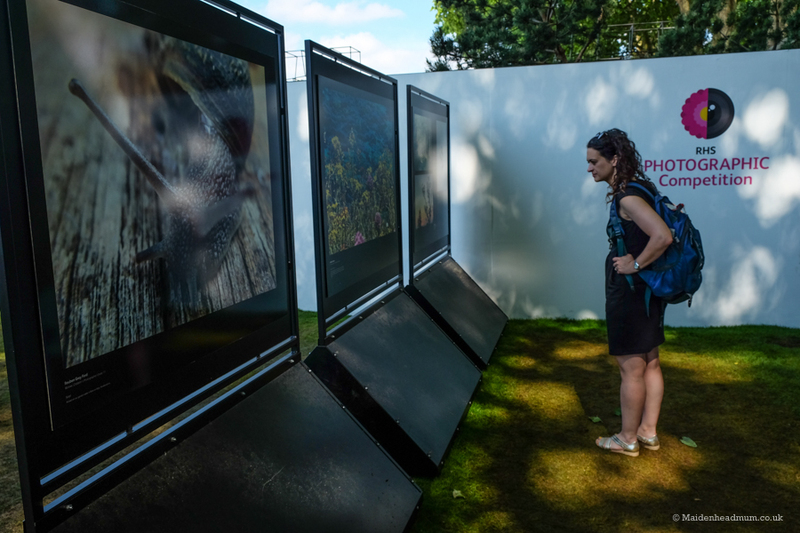 There was a photography competition display from the RHS which was inspiring to look at. I’ve always liked taking photos of architecture so it was good to get some inspiration. Who knows, maybe next year I will enter?! I loved the logo of the RHS Photography Competition! The images were amazingly crisp, vivid and detailed. 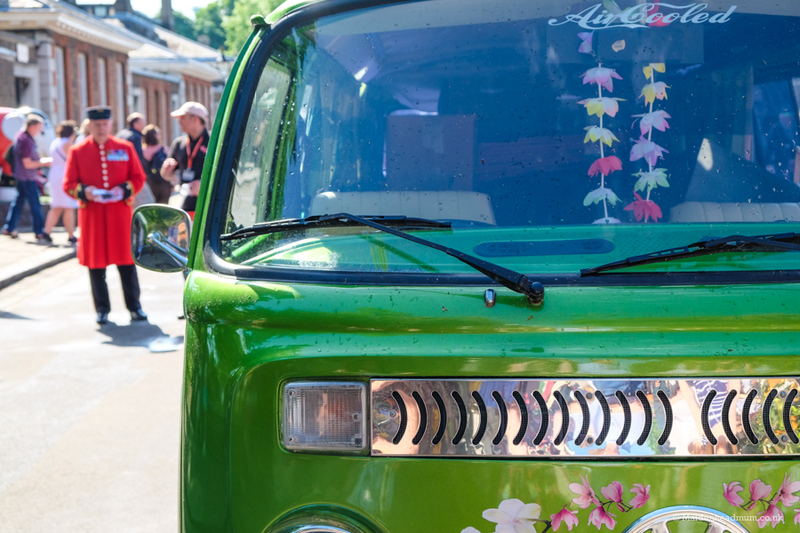 If you want to take photos at the show then I recommend getting there as early as you can to beat the crowds. You can take pretty decent photos outside with an iPhone, but inside the Great Pavilion the light is limited so you’ll need a ‘proper camera’. 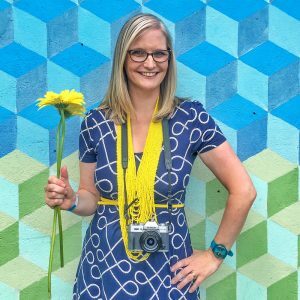 I took my Fuji mirrorless camera with me which is light enough to wear all day. The lens I used has a small zoom and I can use an aperture that means the background gets blurred out (16-55mm f2.8 for the photo geeks amongst you!). I found that I got the best results by being patient with the crowds so I could pick my spot and then getting as low as possible to the flowers. The flip out screen on my camera helps me get really low shots. Here’s the photo I was taking. Here’s the photo I was taking. The funky shapes and colours had caught my eye. I’ve not lived in London for a while so these prices seemed pretty scary! We went for the small option! 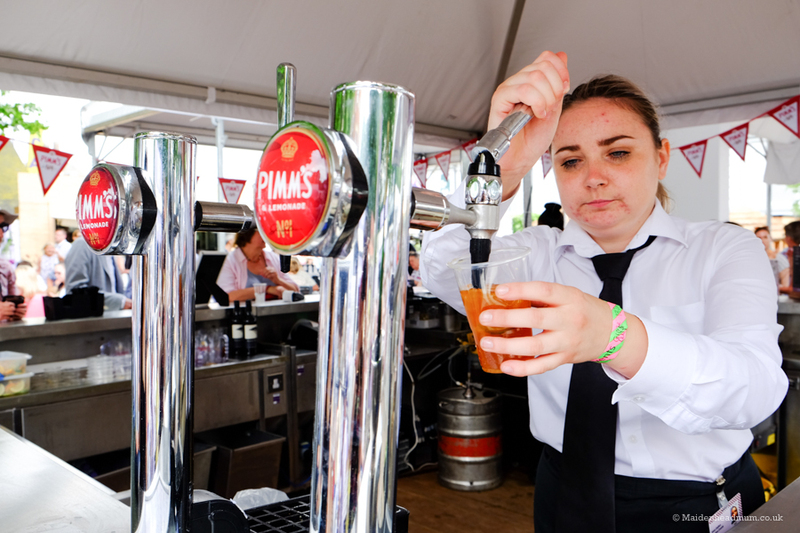 Pimms on tap. Is this a standard feature in pubs now? I was impressed! 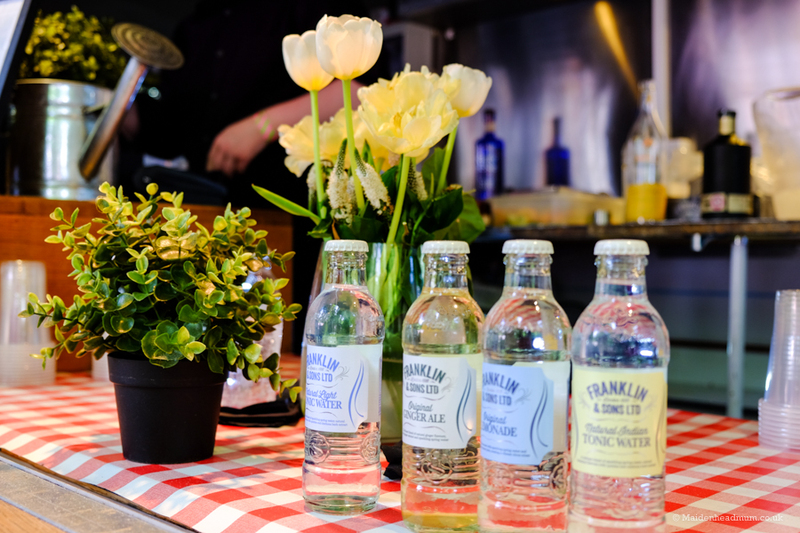 There were lots of food and drink options around the show ground and of particular note, there seemed to be Pimms at every corner! 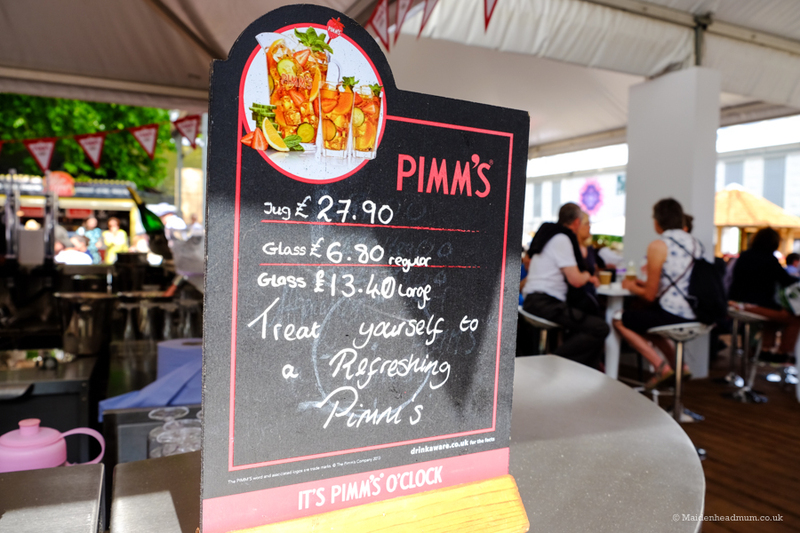 Even at 10.30 in the morning, I saw people walking around with pitchers of Pimms. How decadent. We treated ourselves to a glass and found somewhere to sit before it got too busy. 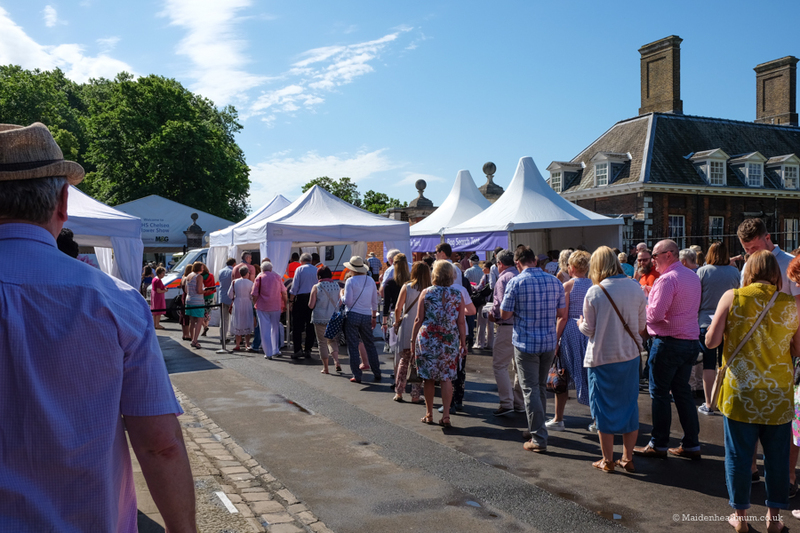 For lunch, we headed back to the artisan food area by the artisan gardens but by mid-day, this area had become really busy, and there were big queues for all of the food and drink stands. 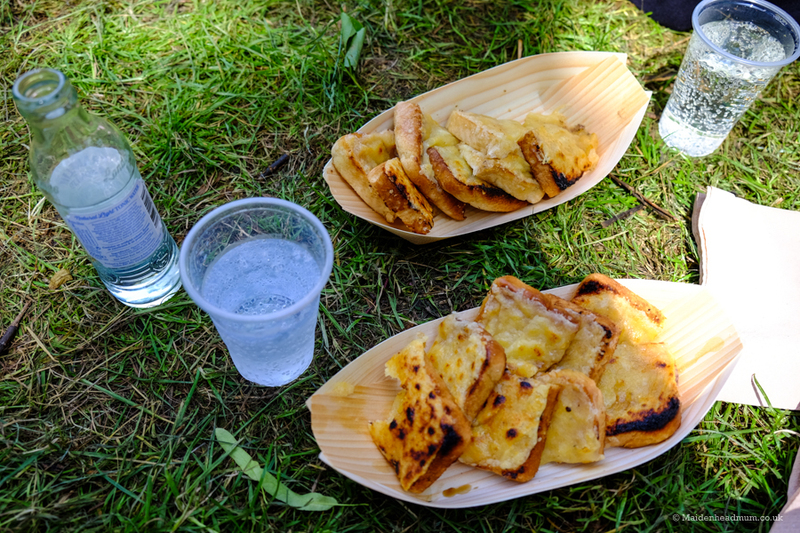 In the mid-day heat, we didn’t really fancy trekking through the crowds to find anywhere else, so we opted for gourmet cheese on toast washed down with a gin and tonic. 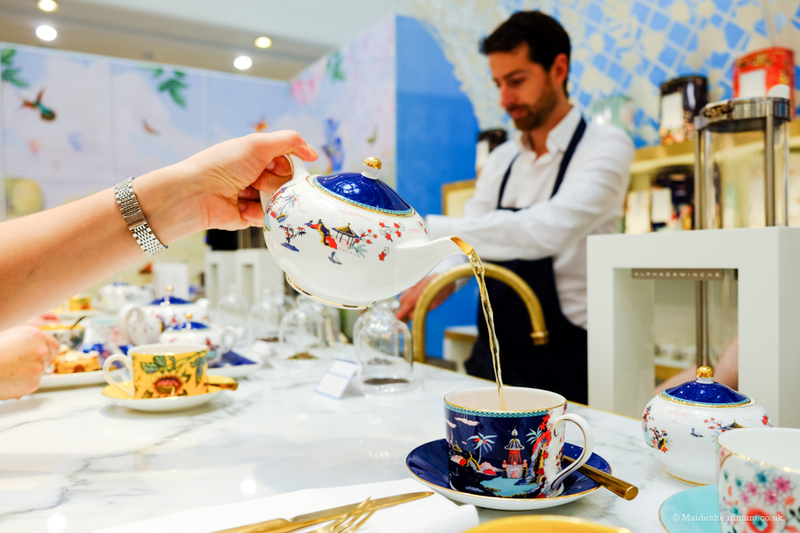 I’ve since learned that Wedgwood had a tea conservatory right in the show grounds which would have been fun to visit, although we stumbled across another one later in the day in Peter Jones. Amazing (but expensive!) cheese on toast! 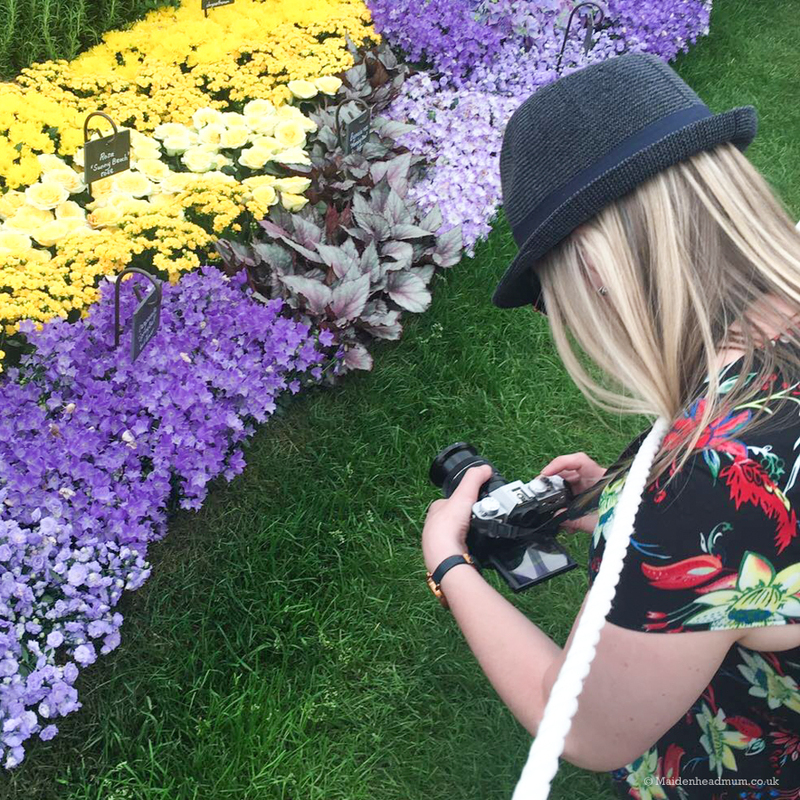 Because we had gone to the show relatively unprepared, we didn’t queue to look at the main show gardens, and although I walked past some and took photos of them, this felt a little bit incidental. There isn’t much information there on the site about what you are looking at so it’s easy to walk past things not knowing what they are. 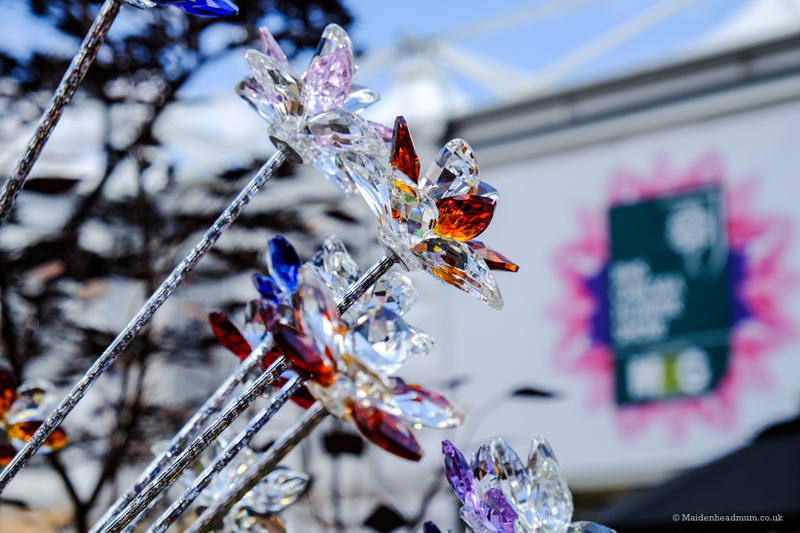 I’ve actually learned a lot more looking at the photos post event and referencing the RHS website which has lots of information about all of the show gardens. I would have liked to have learned a bit more about the story behind the exhibitors and the displays too. The globes that we looked at have a really fascinating backstory: one man’s quest to give a gift to his grandfather became a passion project and ultimately a career. 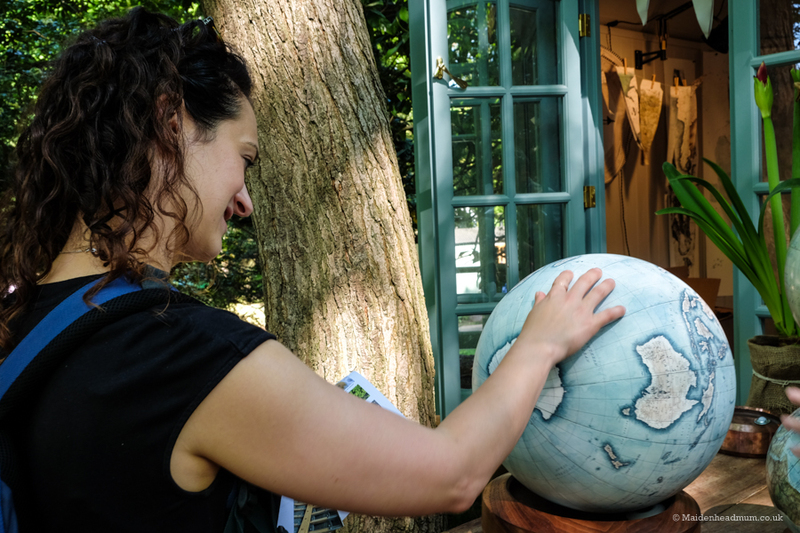 Reading about the globes on the Bellerby & Co website, I was really impressed, but I wonder how many other people would take the time to look up exhibitors after the show? 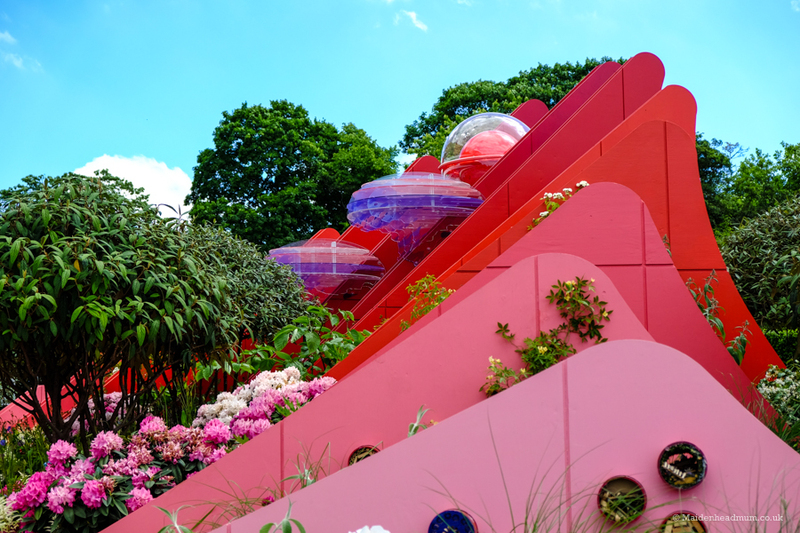 I loved the funky shapes of The Silk Road Garden. 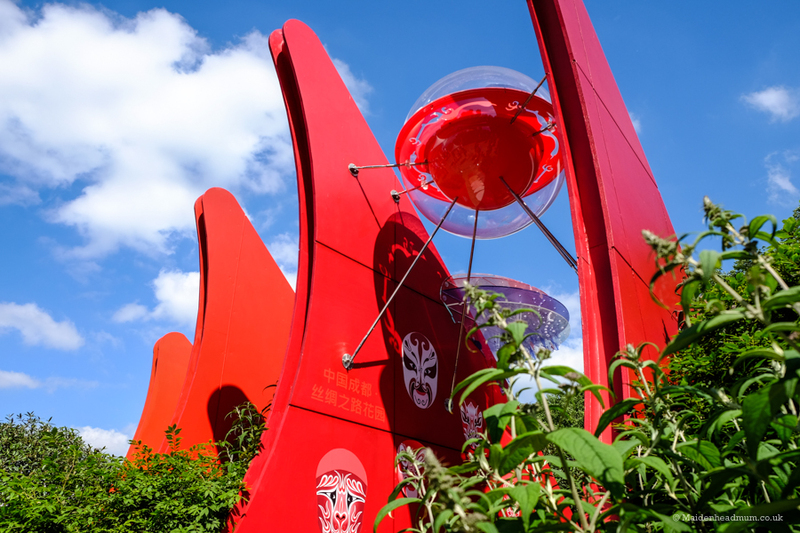 According to the RHS website, ‘these are rising platforms of deepening colour to denote the Silk Road trade route which sit beside ‘mountain blades’. You needed to be patient to get close to some of the designs. 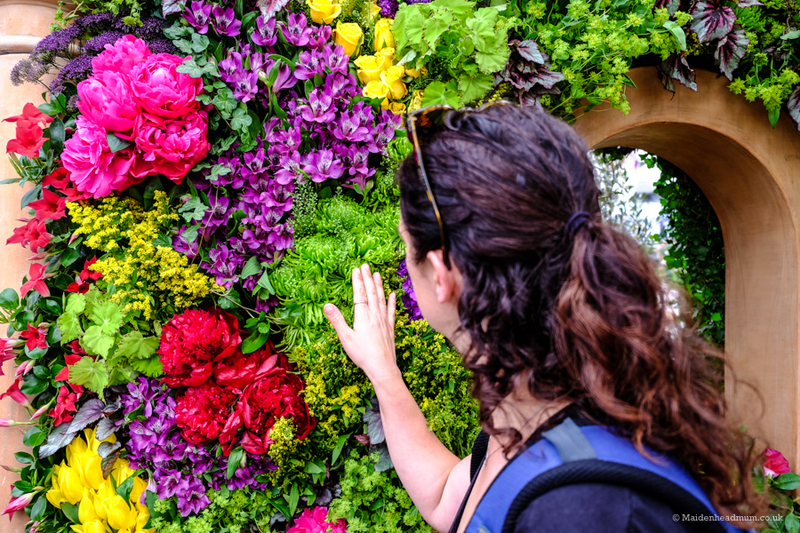 Can you survive at the Chelsea Flower Show if you’re not really into flowers? I had a great time! There is plenty to see and admire as you walk around and it was a photographer’s paradise. 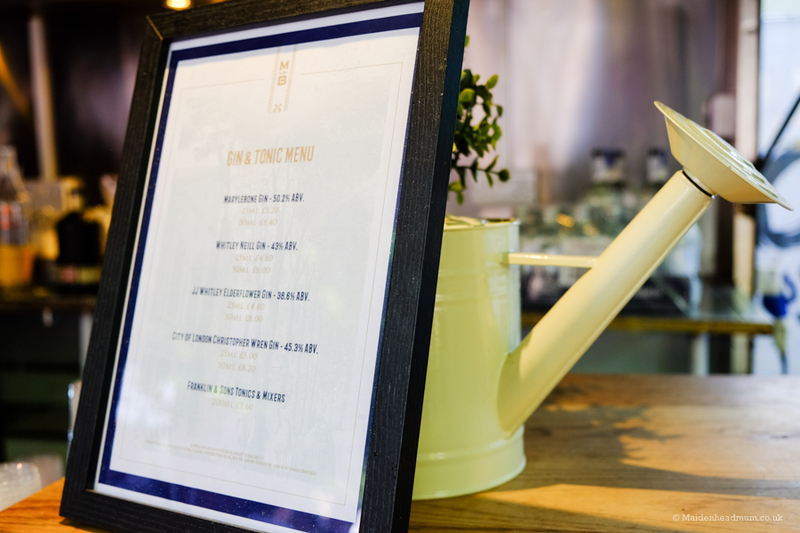 It’s quite an exclusive event and tickets which start at £100 for a full day usually sell out in advance so you do need to think carefully about going and who to take with you. 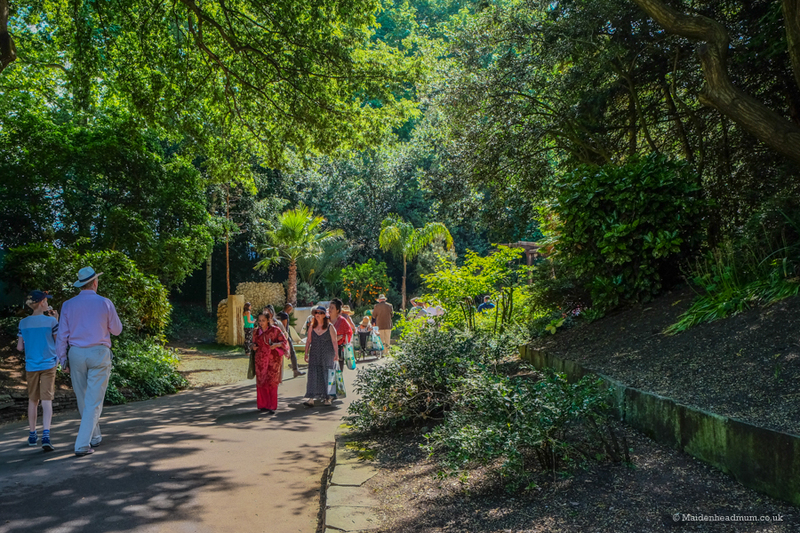 There are no prams or pushchairs allowed into the grounds, and although children over five are allowed in, they pay the same full price as an adult. 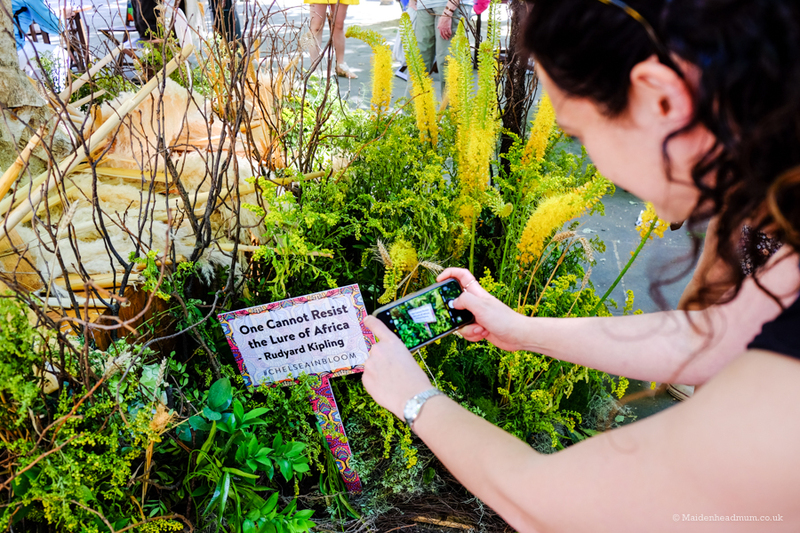 The reality of all of this is that it really felt that people were making the most of their day out: this was child-free fun and people had dressed in gorgeous dresses and outfits for the occasion. If I went again, I would probably try to book a hotel in London the night before so that I could be there for the 8 am opening as I think you could see a lot more before the crowds start to arrive mid-morning. That way you could also see more of the show gardens (these had really big queues when we were there). 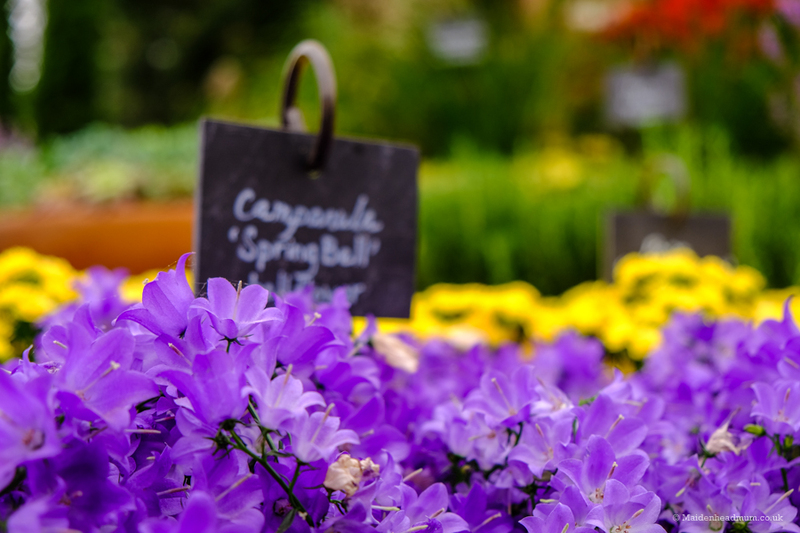 Since visiting the show, I’ve found a new love of photographing flowers and have been to the Savill Gardens in Windsor with my mum. I’ve learned that you can love flowers, even if you have no hope of ever keeping them alive yourself! 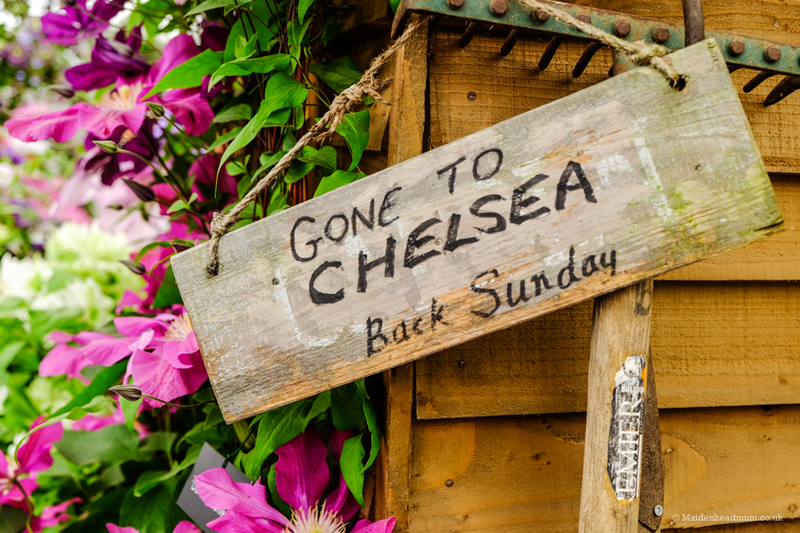 Exploring Chelsea while the Chelsea Flower Show is on. 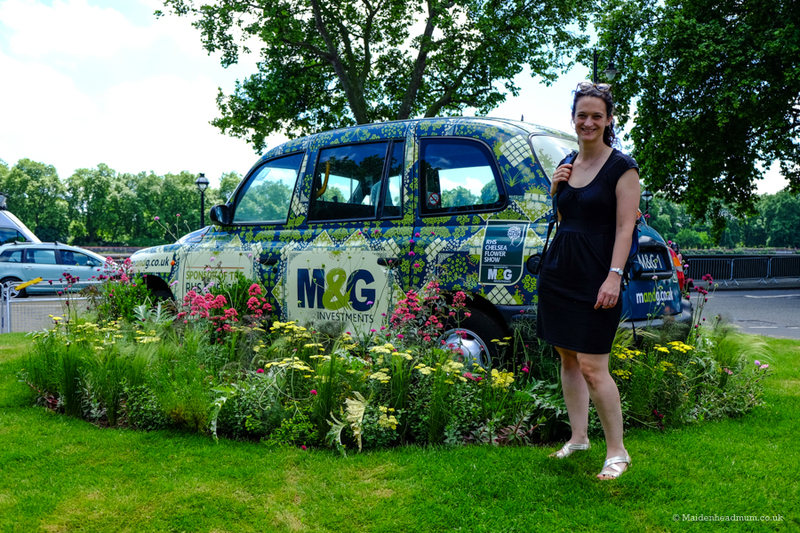 I loved this flower themed black cab. 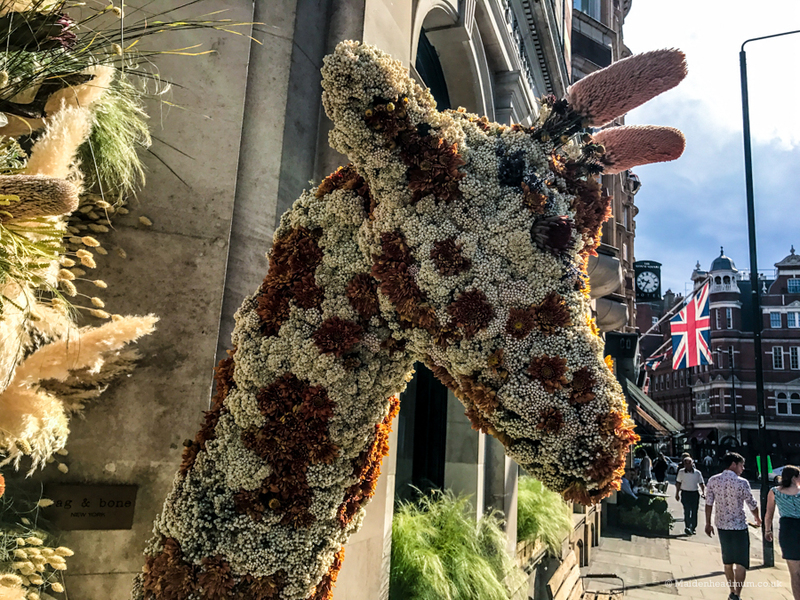 After the show, we grabbed a taxi to the Kings Road back to Sloane Square to investigate some of the amazing floral displays that we had seen on our way in. 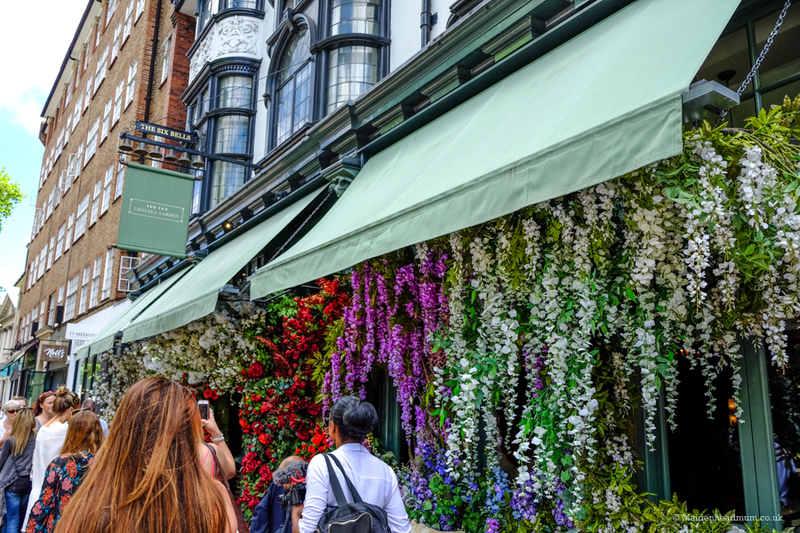 Some of the local retailers have special offers on around the time of the Chelsea Flower show too, so it’s worth putting some time aside to browse and shop. 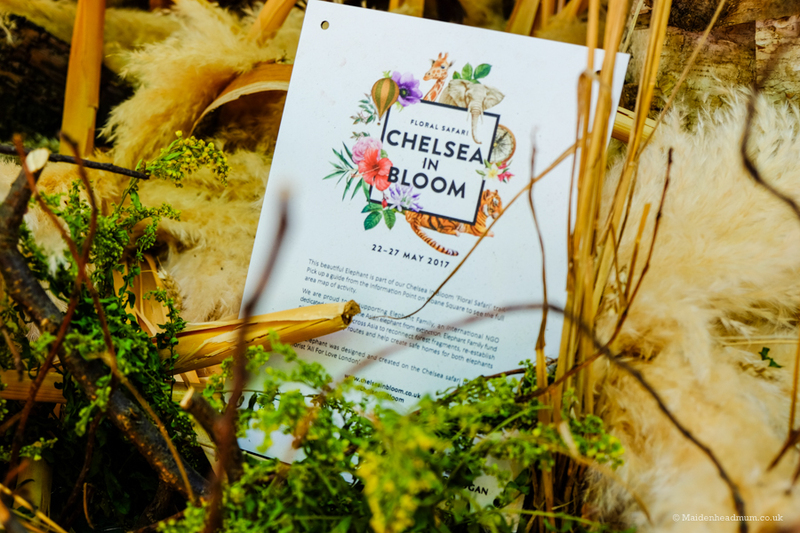 I dragged Rebecca along to the Orla Kiely shop on the King’s Road as they were offering a special gift with every purchase to commemorate the Chelsea Flower Show. We were even given a glass of bucks fizz while we looked around admiring the patterns. What a blissful way to spend a child free day! My friend married a South African so this sign was particularly apt! Even estate agents take part! 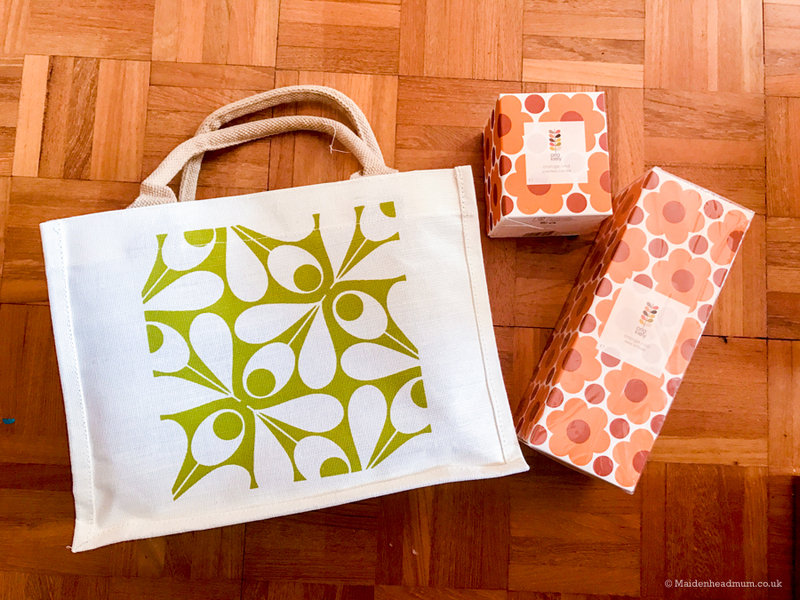 My gifts with purchase from the Orla Kiely shop in Kings Road. As an Orla fan, this was VERY exciting! 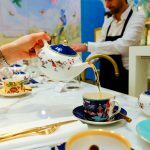 We then felt like we wanted to put our feet up for a bit and sit and have a drink, so we went into Peter Jones and found the Wedgwood Tea conservatory where we stopped for tea and scones. Yum! All in all, a great day out. Thank you, Rebecca for taking me as your plus one! 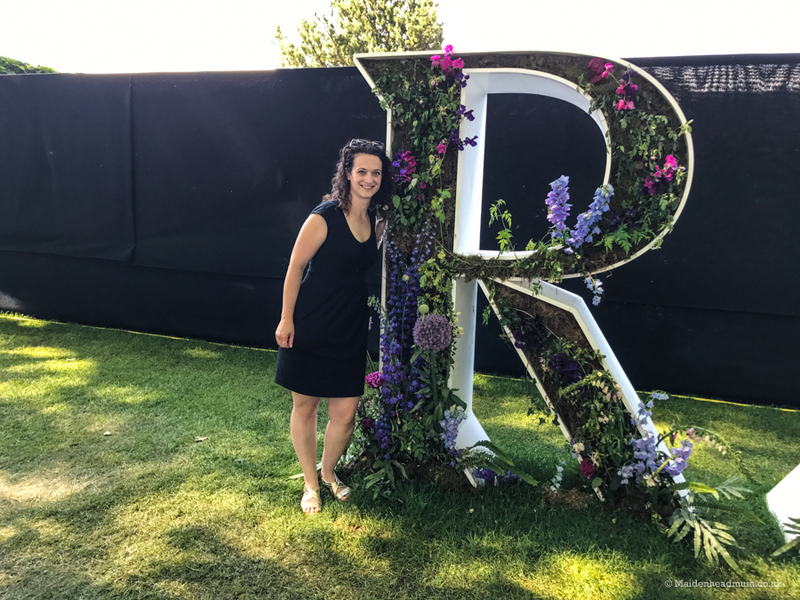 Rebecca organised two ‘marathon in a month’ events which saw people in Maidenhead, Scotland, Wales, Norway and America join in to run 26 miles around their local area across the month to help fundraise for Tommy’s. In addition to that, she then ran the London marathon herself, an amazing achievement to manage all of that, AND to fit it around her two small children and running her own business! An incredible £7,400 was raised for Tommy’s, a charity close to both of our hearts. Unbelievably, one in four women lose a baby during pregnancy and birth, a shocking statistic in this day and age. 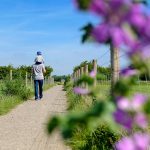 When I was pregnant with my second child I had Placenta Praevia which put both me and the baby at so much risk that I spent a month in hospital, which hardly seemed like a 21st century solution. Tommy’s fund much needed research into pregnancy problems and I hope that this helps prevent more people from suffering. 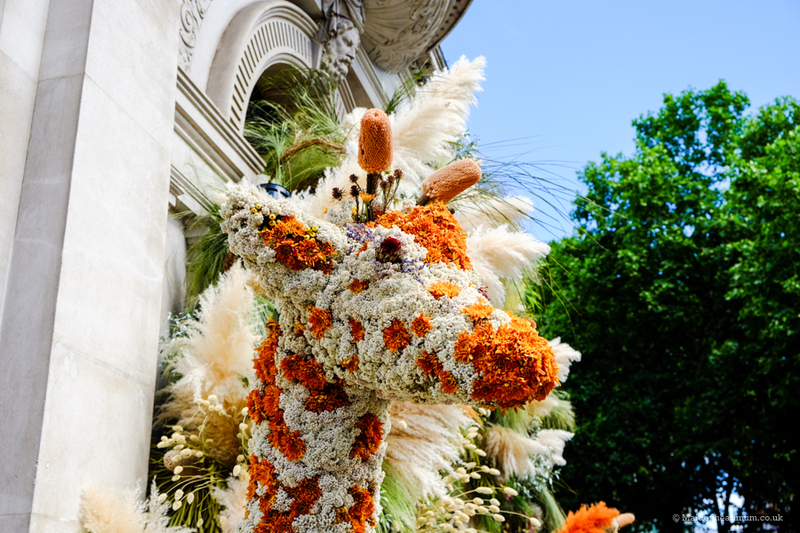 M & G Investments are sponsors of the RHS Chelsea Flower Show and are also a longstanding supporter of Tommy’s charity. As a thank-you for Rebecca’s amazing fundraising efforts, M & G Investments gave her two tickets to the show.